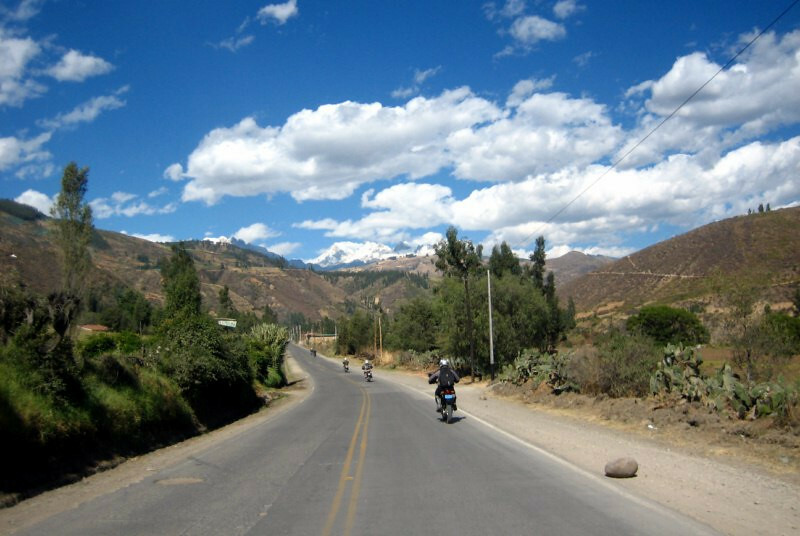 This next part takes me from Cajamarca, down to the coast to the start of the Canyon del Pato, back up to the snow peaks and a ride through Huascaran National Park. 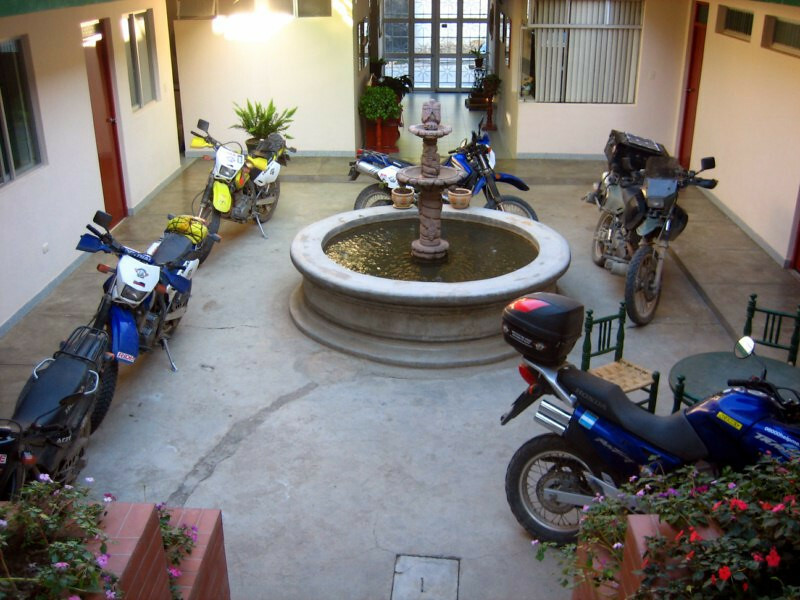 Staying with Adam (right) in Cajamarca for a night, through CouchSurfing. We were walking around the streets and ran into Holger and Anja who were happy to speak in German with Adam. 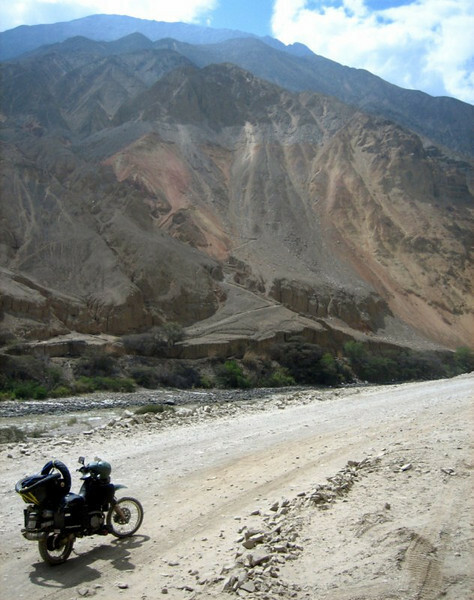 They camped out at the bridge at Balsas the previous night and just rolled into the city. Adam is here on his year of voluntary service with the German government, which is required in place of military service and is done usually before heading to college. 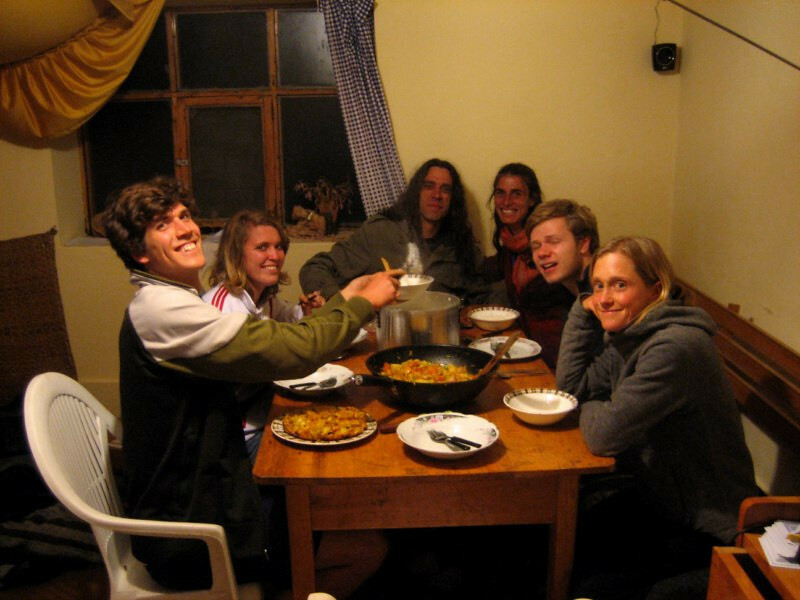 He invited them to the farm where he was staying but Holger was after a hotel after a few nights of camping. Taking a tour of the city with Adam. 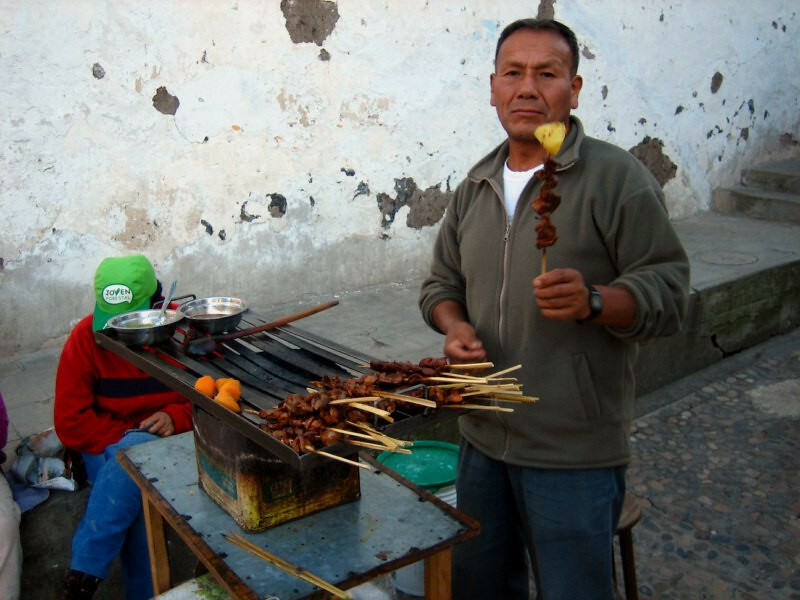 Trying ‘anticucho’, which is grilled cow’s heart, a local snack. Mmmm. 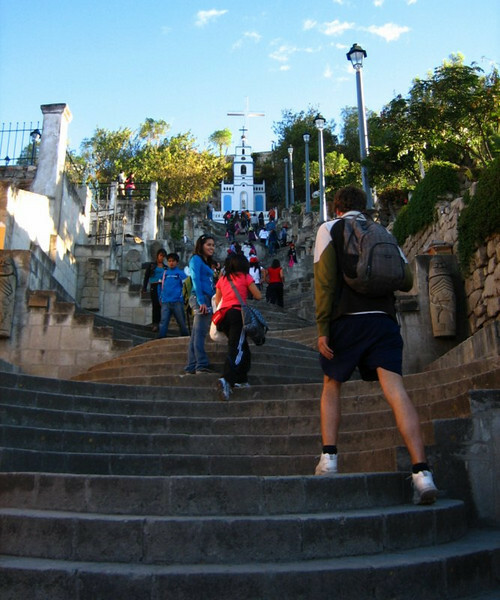 Climbing up some concentrically elevated steps for a view of the city. 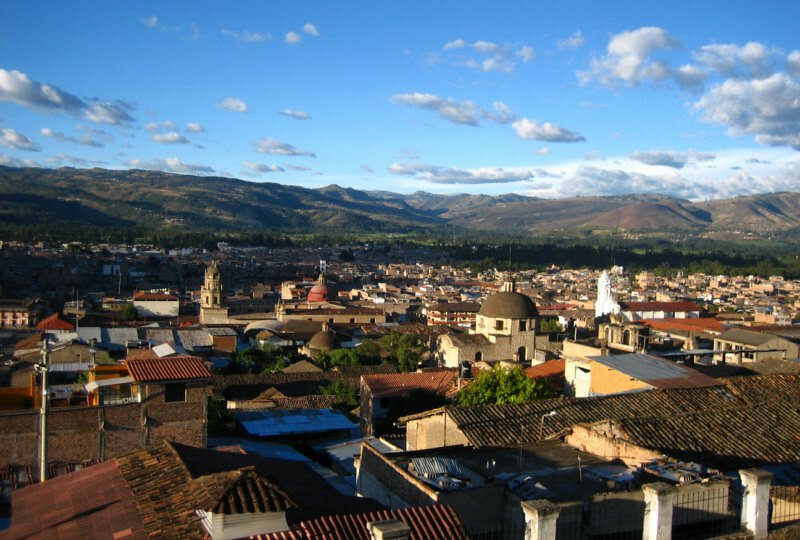 The beautiful colonial town of Cajamarca. 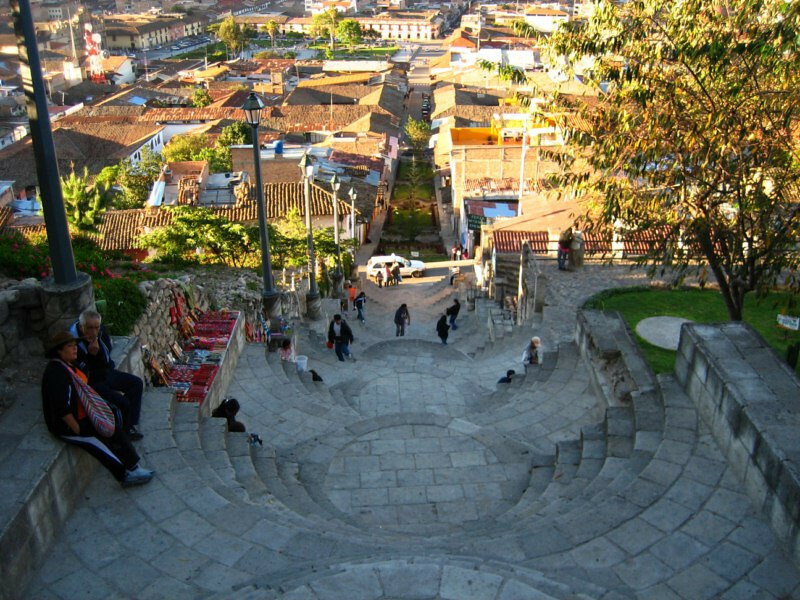 It’s known as the city where the last Inca king was killed by the Spanish. 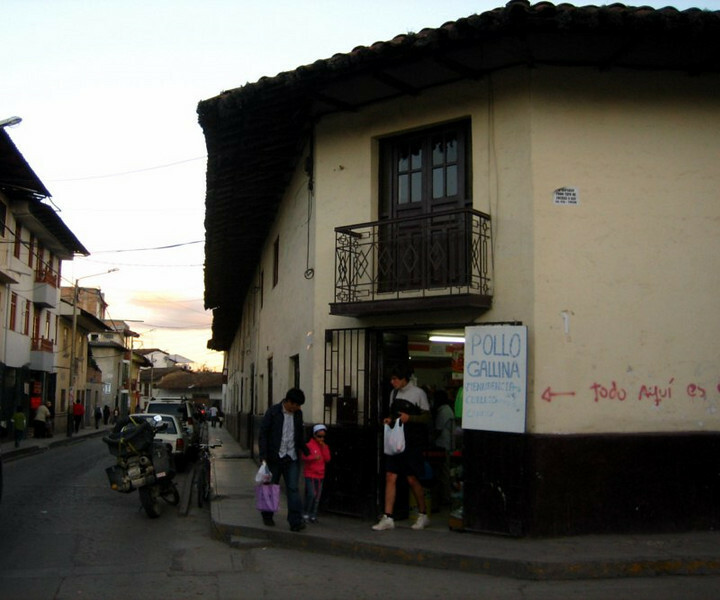 Atahualpa was tricked by the Conquistador Pizzaro into turning over a lot of gold and silver in exchange for his release, but they still killed him. What a brutal world view the European colonizers had, and all in the name of the church! 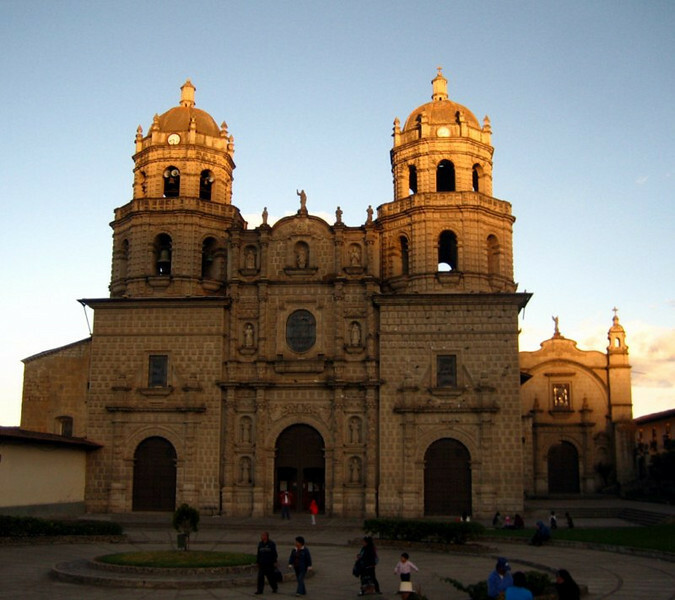 Adam said in his talks with some Peruvians, they say the one thing they disdain about being colonized was being forced to take up a new religion. Heading back down the circular steps. 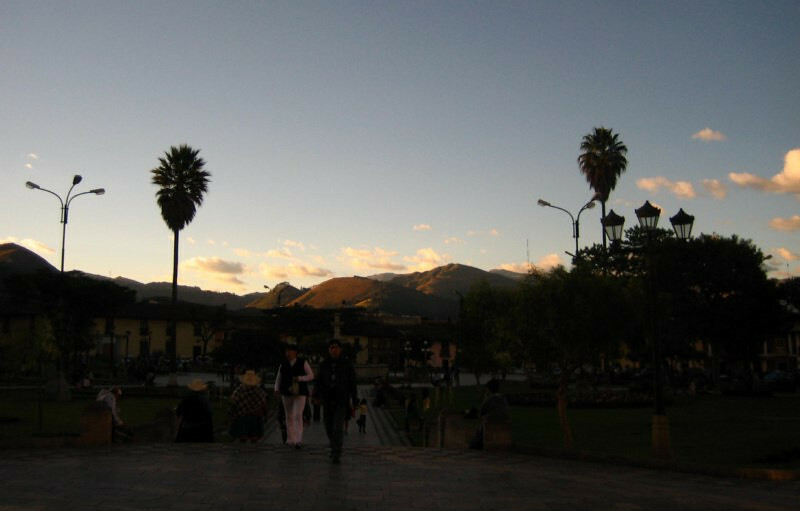 Sun setting over a plaza in Cajamarca. The disappearing sun still illuminating the towers of this cathedral in the main plaza. Adam buying some groceries for the dinner I was going to cook. At the farm outside the city where Adam and other volunteers stay. 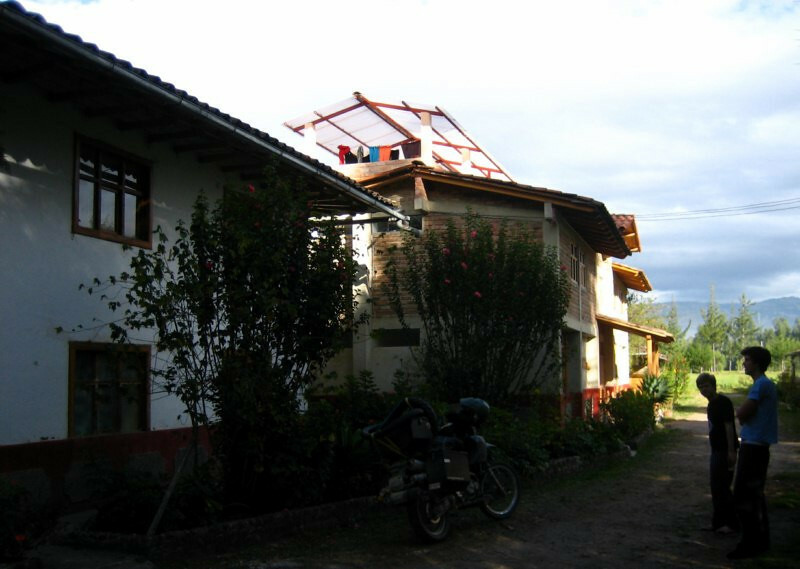 His project involves working with handicapped children. 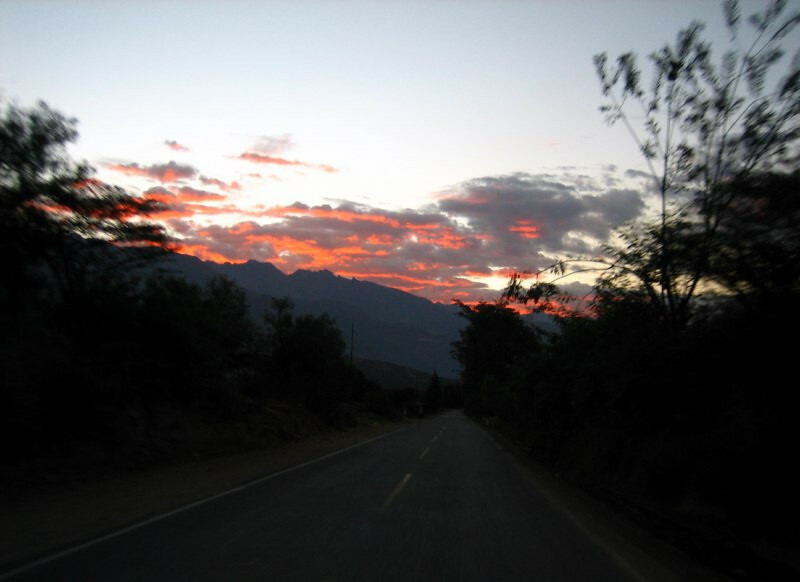 Sunset over the hills surrounding Cajamarca. 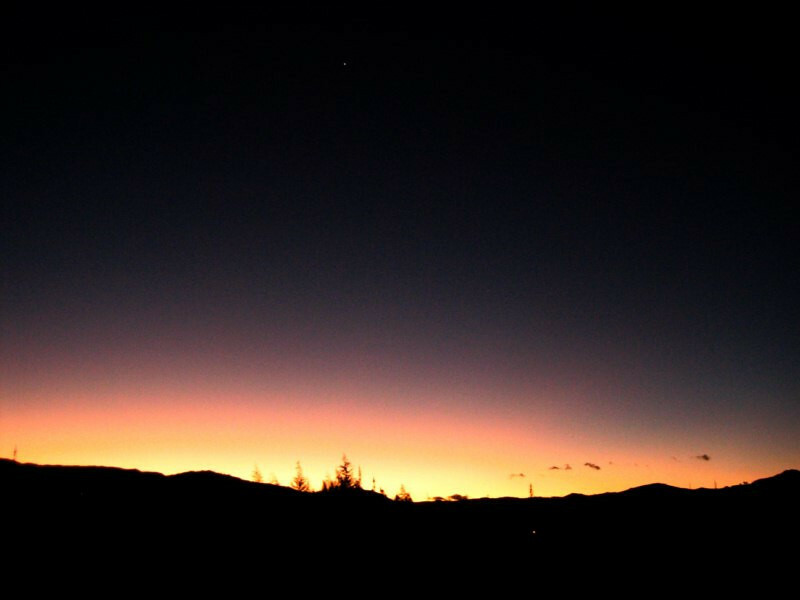 Venus shining through dusk up above. 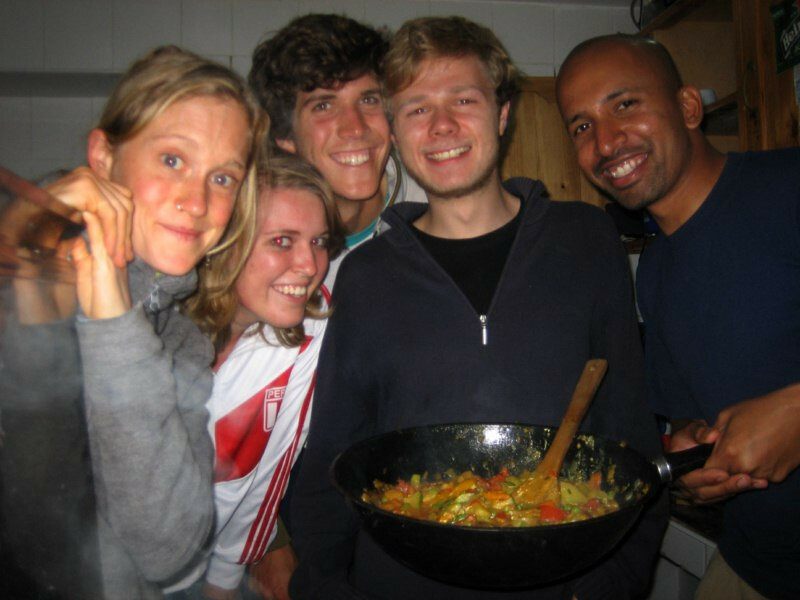 I prepared a vegetable curry for Adam and his co-volunteers. They were interested in seeing the whole process and I tried to convey that lots of patience is needed when making a curry since you have to add each ingredient only after the curry has reached a specific phase. I also shared with them how the sound of the cooking pot (the water from the vegetables interacting with the oil) conveyed important info about the temperature, which is key in getting the desired consistency. We enjoyed a nice meal together and Adam even tried eating with his fingers, which for me is the most natural way to eat rice. We like to say it tastes better then eating with a metallic object and the fingers can sense when the temperature of the food is right to put in your mouth. Taking off the next morning after a nice evening at the farm. 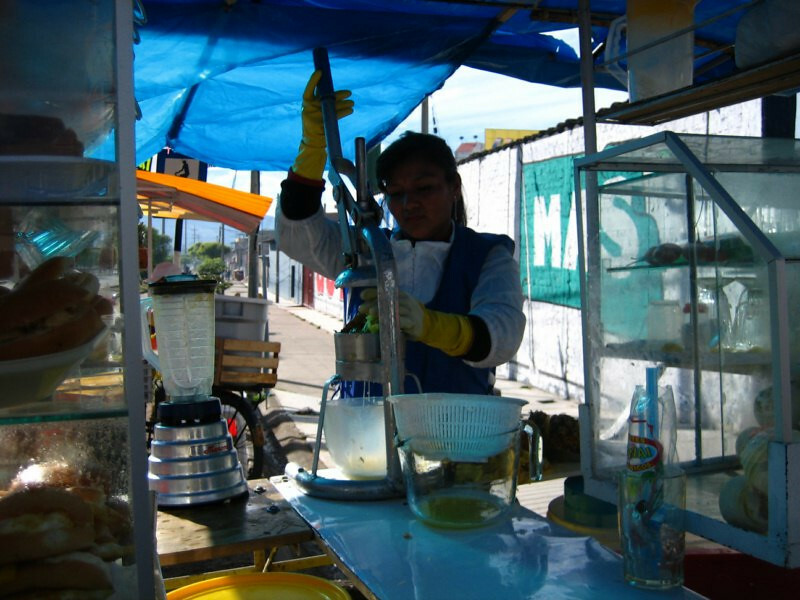 Getting some fresh orange juice and a sandwich at a kiosk on the road. 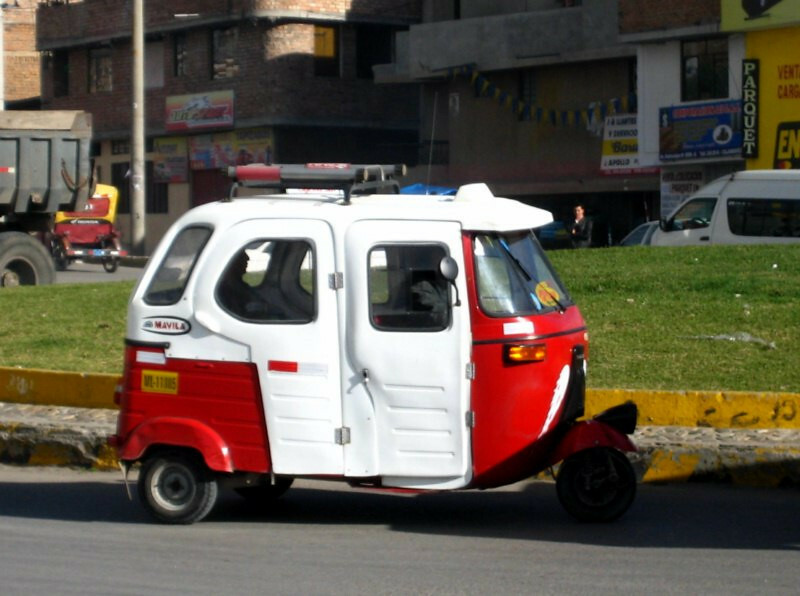 A Bajaj autorickshaw with doors for the cold climate, something you’ll never see in India, where they come from. 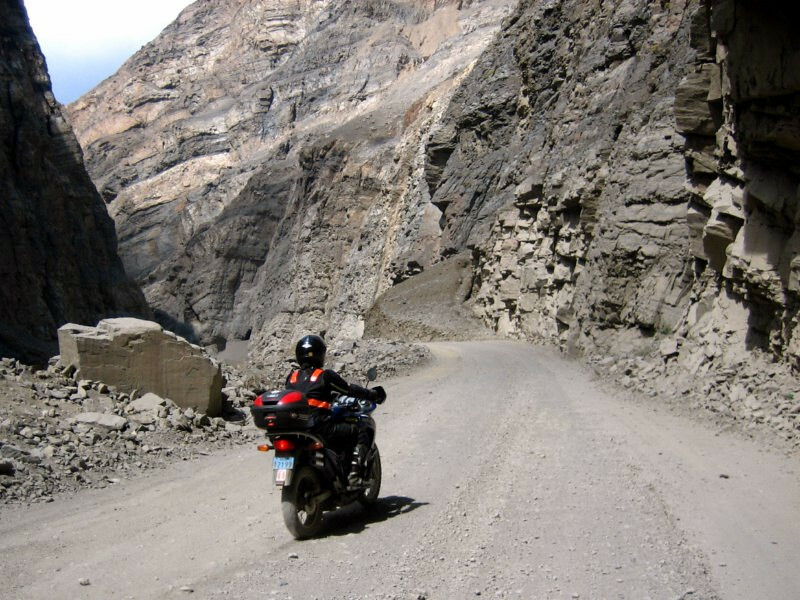 After climbing up to 3,200 m (10,500 ft), the road plummeted down to the coast. 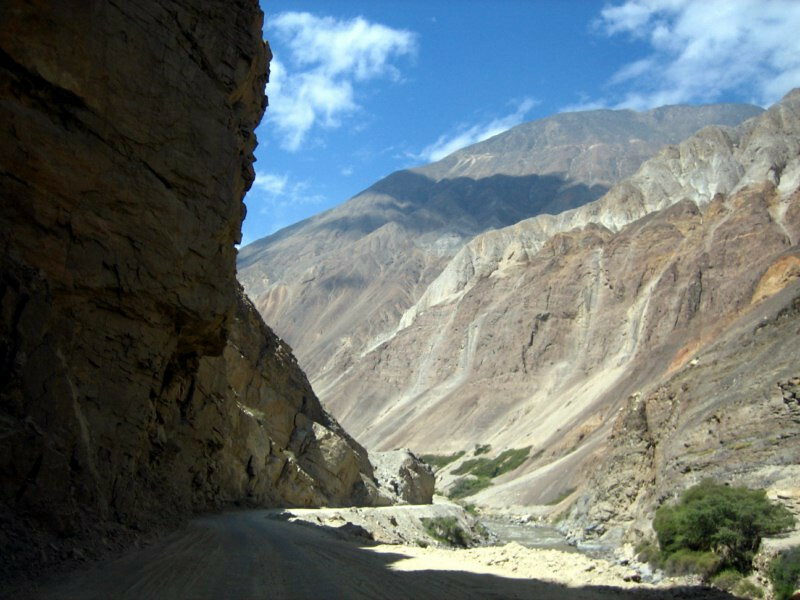 Note the U-shaped sedimentary lines in the mountain behind. A beautifully blue lake near the coast as the terrain started drying out. 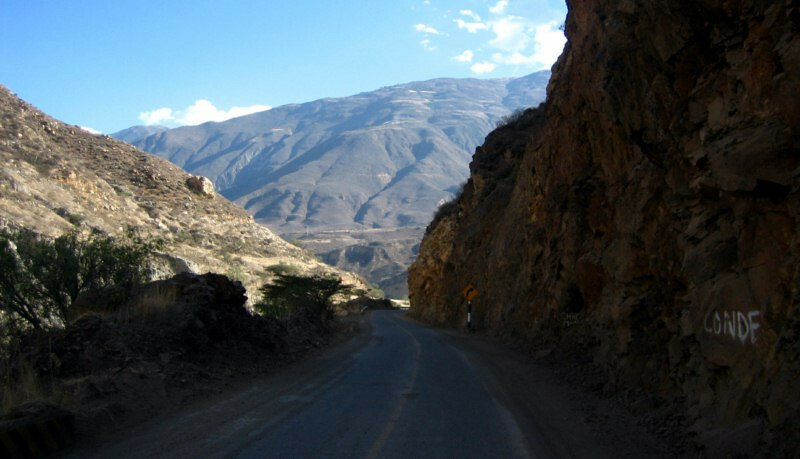 The flat Panamericana highway running through Peru’s costal desert. 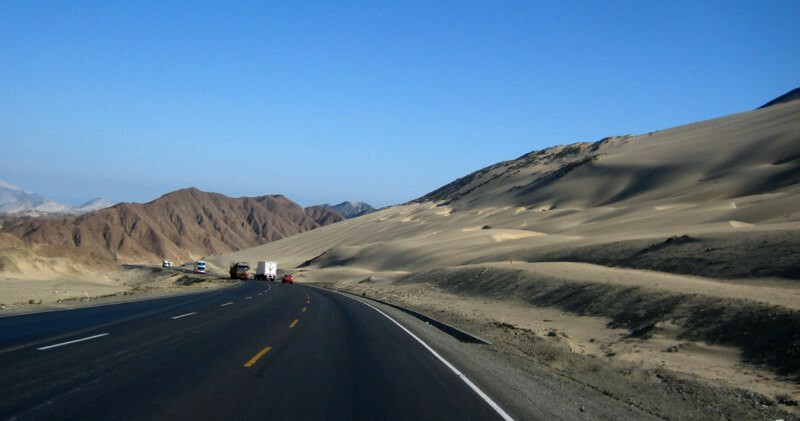 They were huge sand dunes right by the highway and many places with sand blowing across the road. 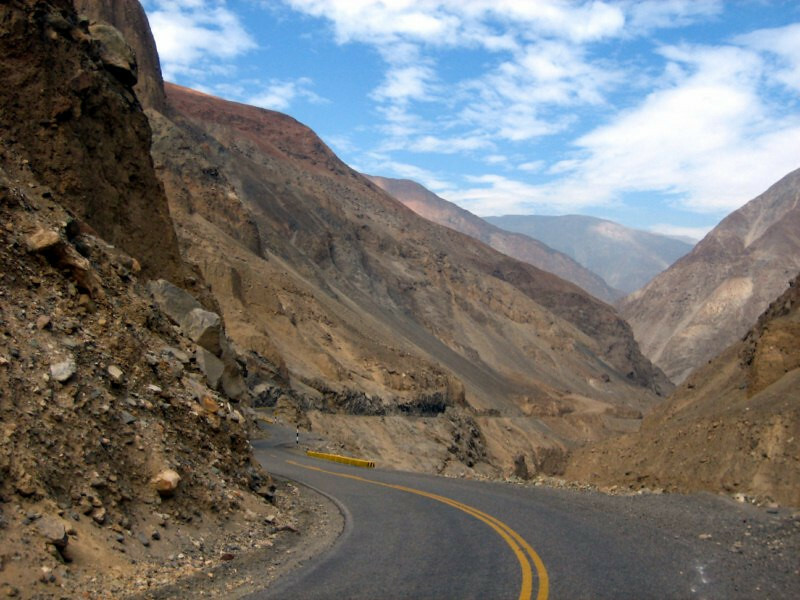 The super tall Andes block all the rain that falls on the Amazon side, leaving the Pacific coast very dry. 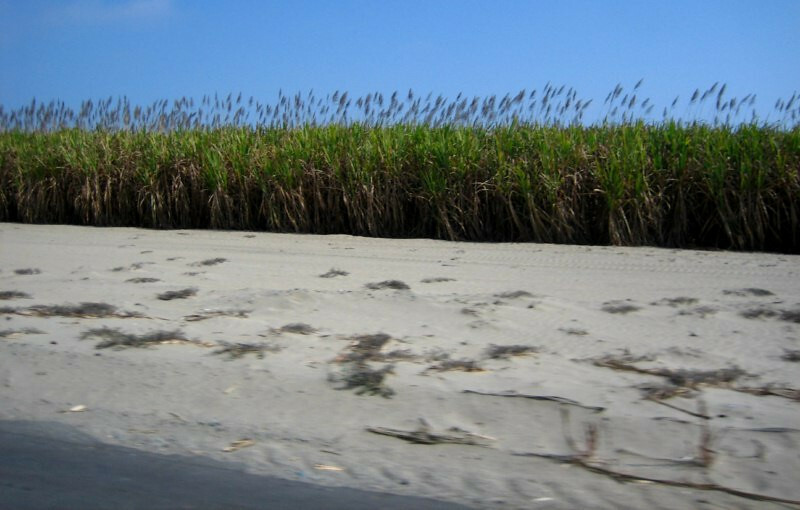 Growing sugarcane in the deserted coast; putting marginal land to commercial use. And the pollution that comes along with growing sugarcane. 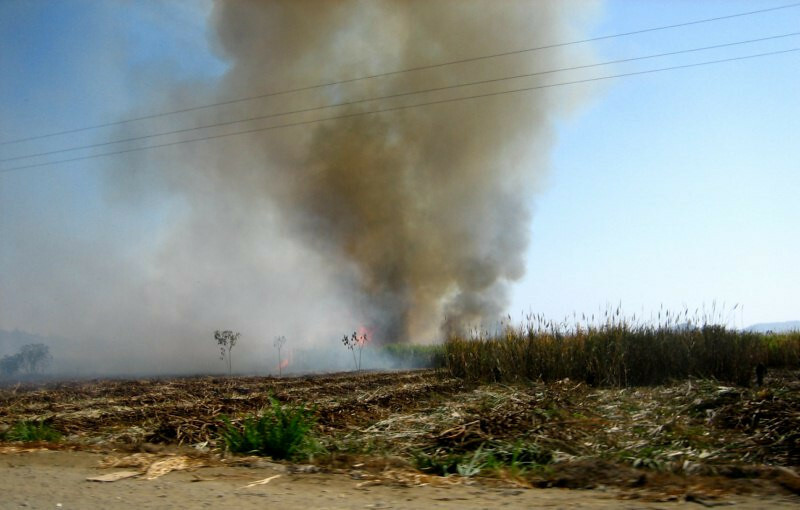 The fields have to be burnt to remove unwanted plants. I’m looking forward to the time when society will realize that you can’t continue polluting like this without adding the cost of pollution into the product. That would change everyone’s view on pollution and lead to a sharp curtailing of it. 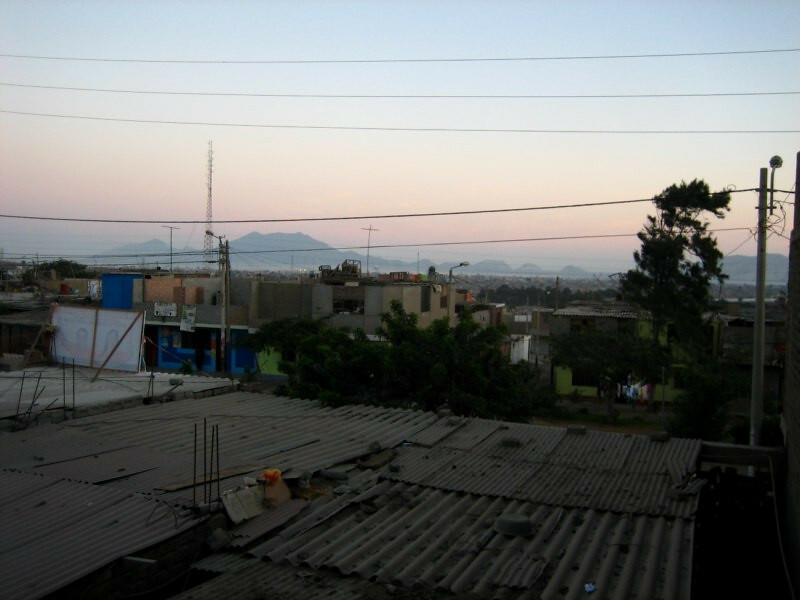 Spending the night in Chimbote, a city known as the fishing hub of Peru and the stench of fish permeated the whole city. Back in the hey days, when no one knew about sustainable resource use, they over-harvested the seas and now with very little fish for the nets to catch, the local economy has slumped. 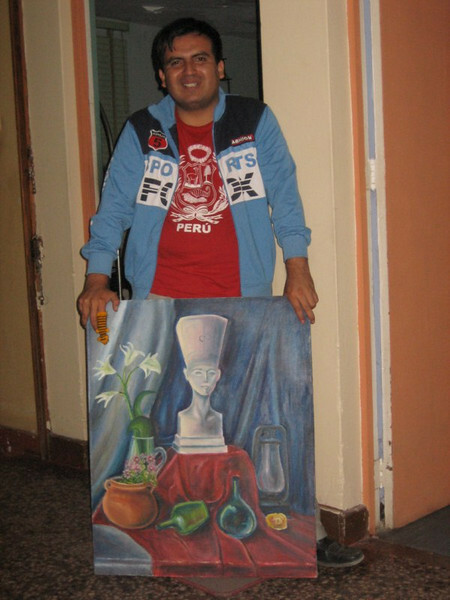 Staying with Juan Pablo, through CouchSurfing, who’s an aspiring artist. 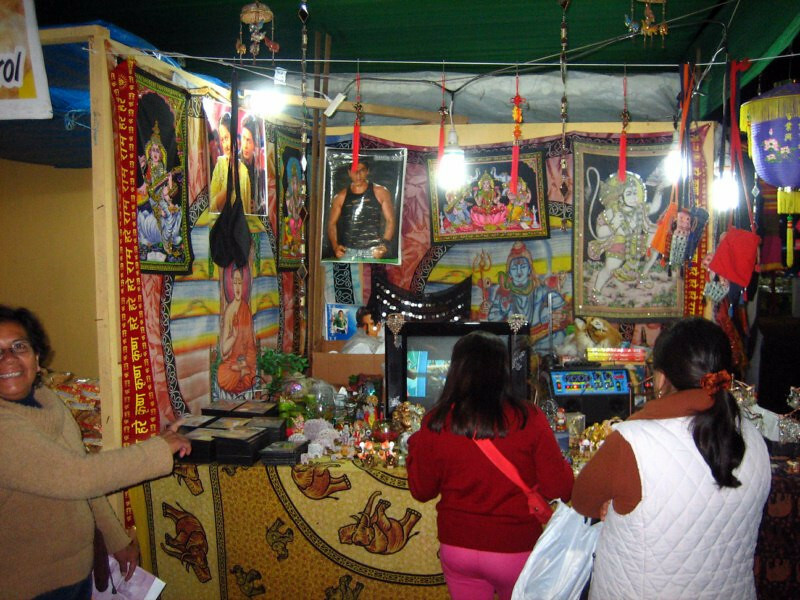 We took a walk through a local fair and I was surprised to find a booth blasting Bollywood songs (India’s Hollywood). Seems like Indian culture is quite popular here. 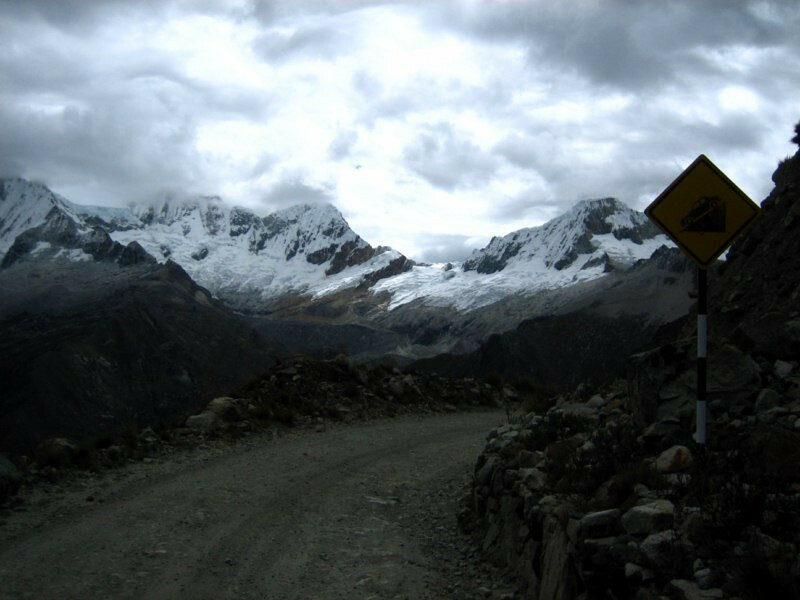 Heading out the next day back up the Andes. 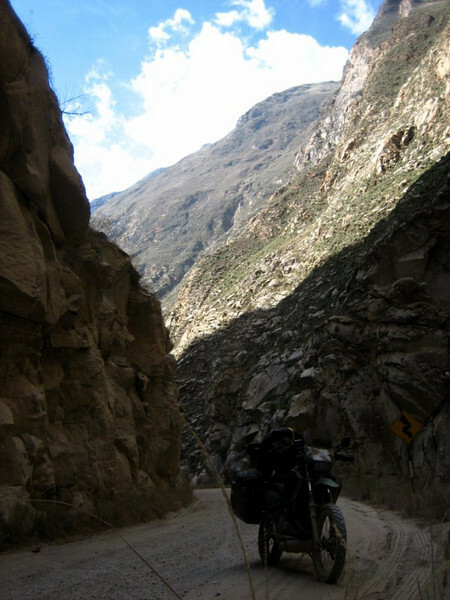 I came this way specifically to ride the length of the road through the Canon del Pato (Duck Canyon). Beautiful views started soon after the walls of the canyon started to close in. 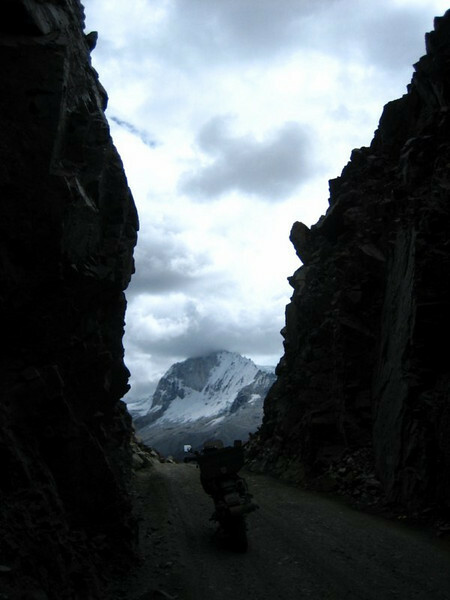 On the trail through the Canon del Pato. The road was quite rough and I was poddling along in 1st and 2nd gear, trying not to stress my rear shock too much with all the weight I have. The canyon is very dry and vegetation is sparse, but there was a stark beauty, especially the clash with the clear blue skies above. Taking frequent breaks as the engine was getting quite hot with the slow speeds. 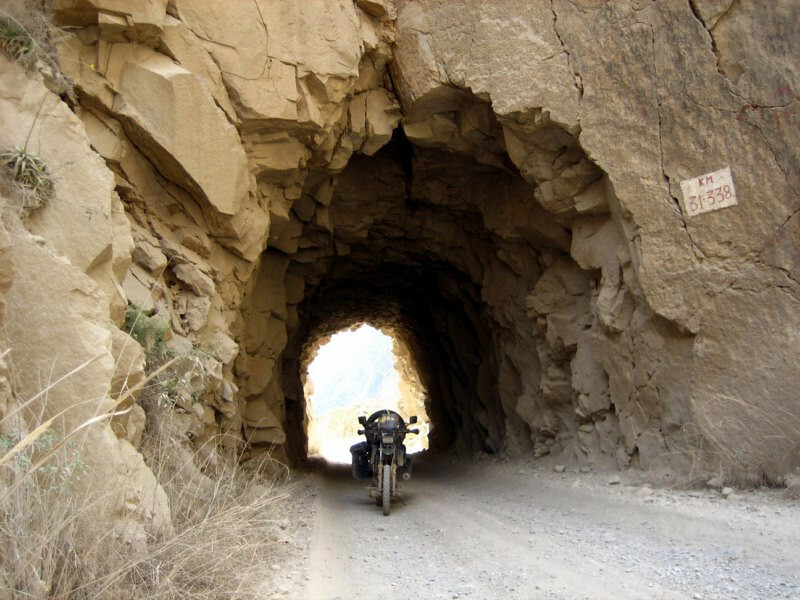 Coming across the first tunnels in the rock, which is what this canyon is known for in the motorcycling community. 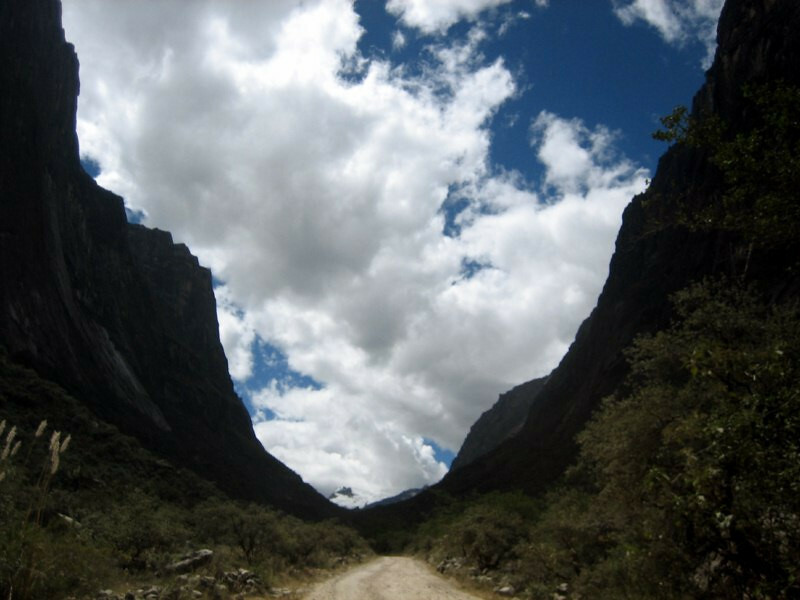 The rushing Rio Santa, which created this canyon, slowly carving down and carrying the minerals away. The elevation was quite low for most of the canyon and shadows of cliffs provided some relief from the heat. 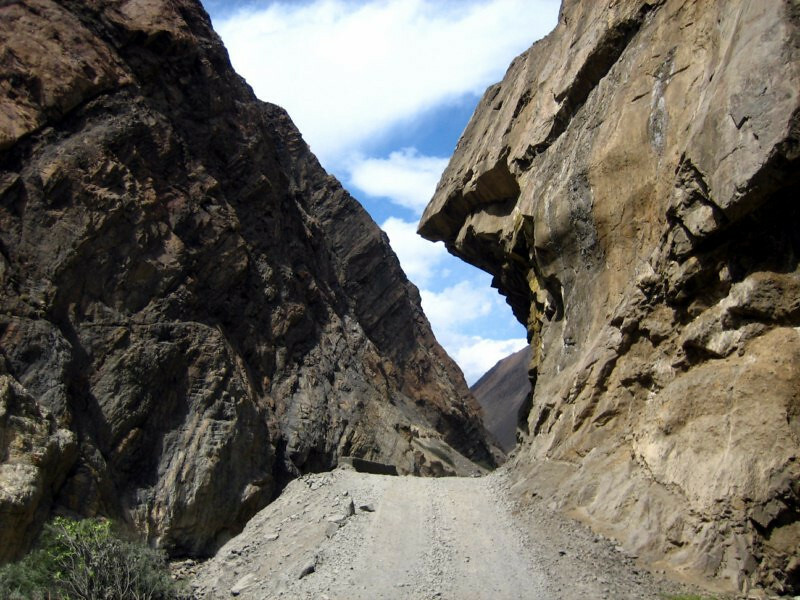 A fascinating geologic cut-away. The Earth’s crust is shaped like putty by the convective forces of the magma that circulates deep under our feet. We are but alive for a short blip in the story of this planet. Entering tunnels cut right into the cliff-sides. 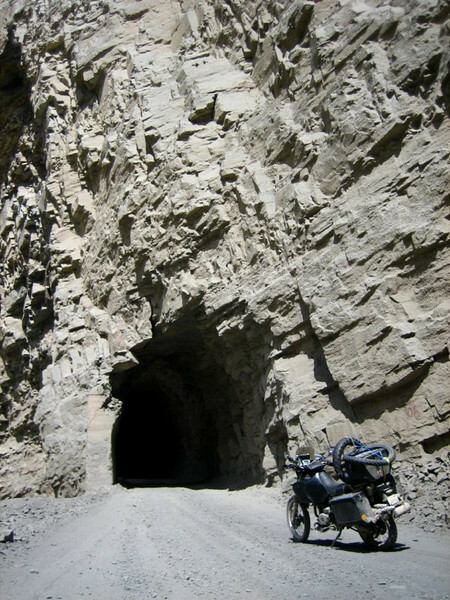 The contrast of the brightness outside and the absolute darkness inside the tunnels and the delay in my pupils adjusting to that made it quite hairy to pass through, especially with lots of sand in the tracks. 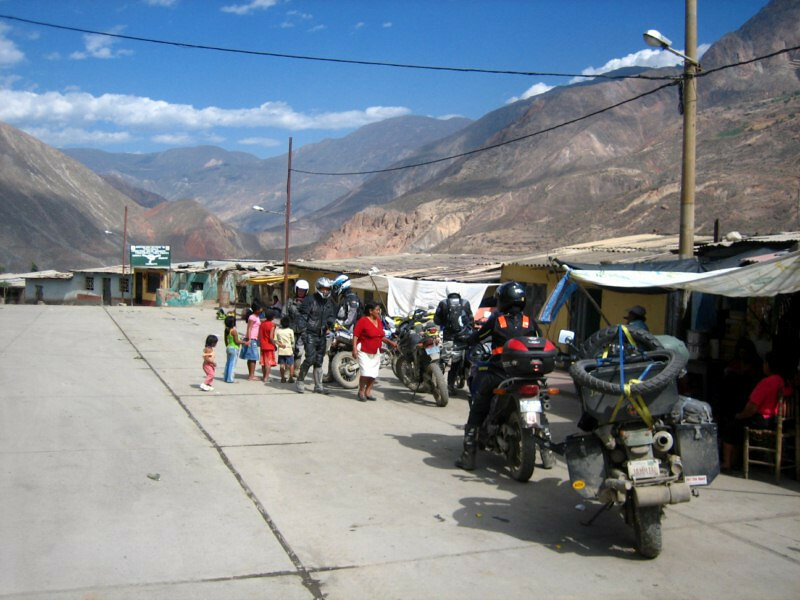 Being passed by a bunch of bikes, which I later found out were part of Adventure Peru Motorcycling, a tour group. 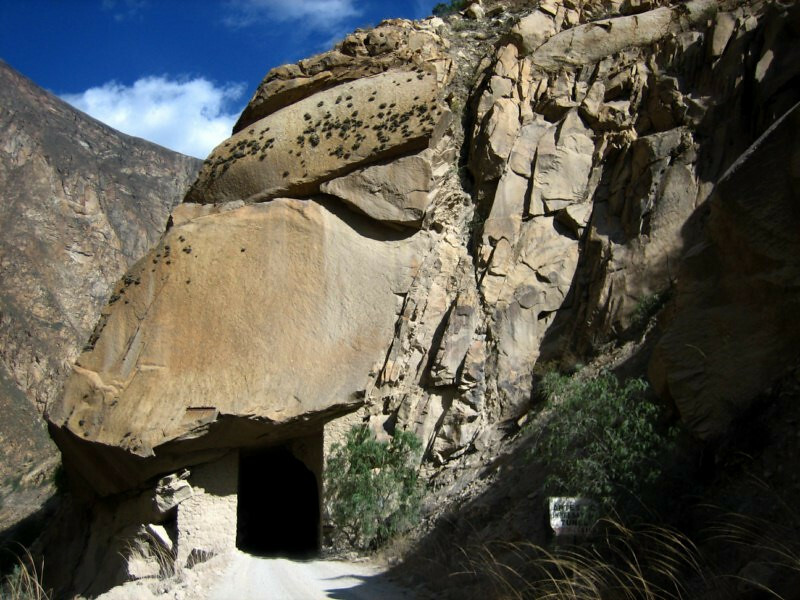 Tunnel cut into the slanted bedrock. 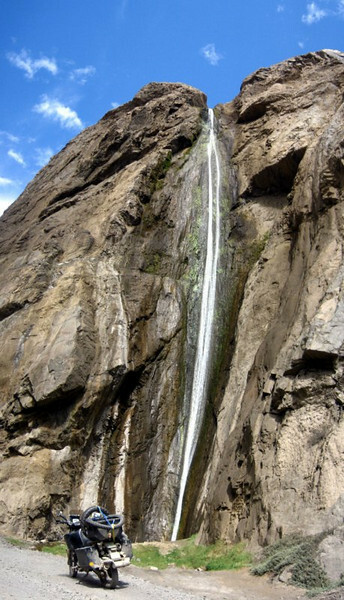 A sleek waterfall by the road. 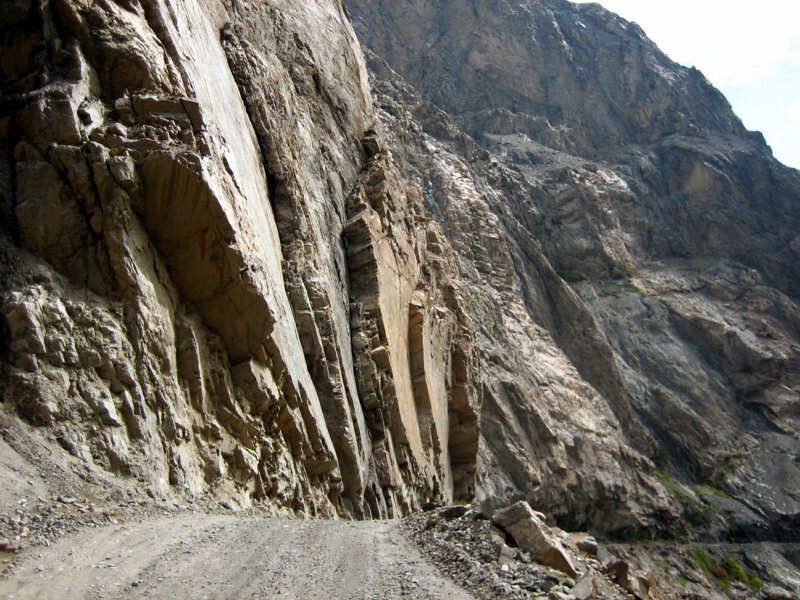 The construction of the road exposing various slabbed layers of rock. 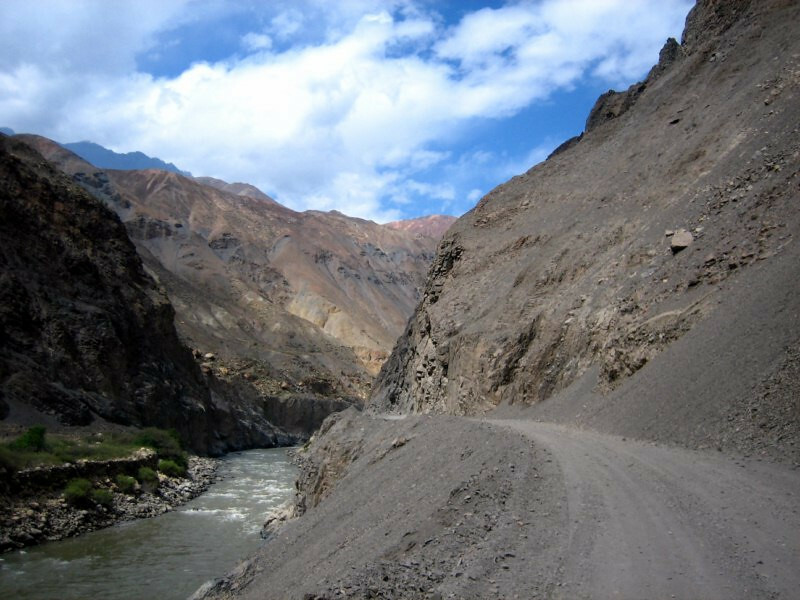 The road following the path of the river. Meeting up with the tour group at the next town. 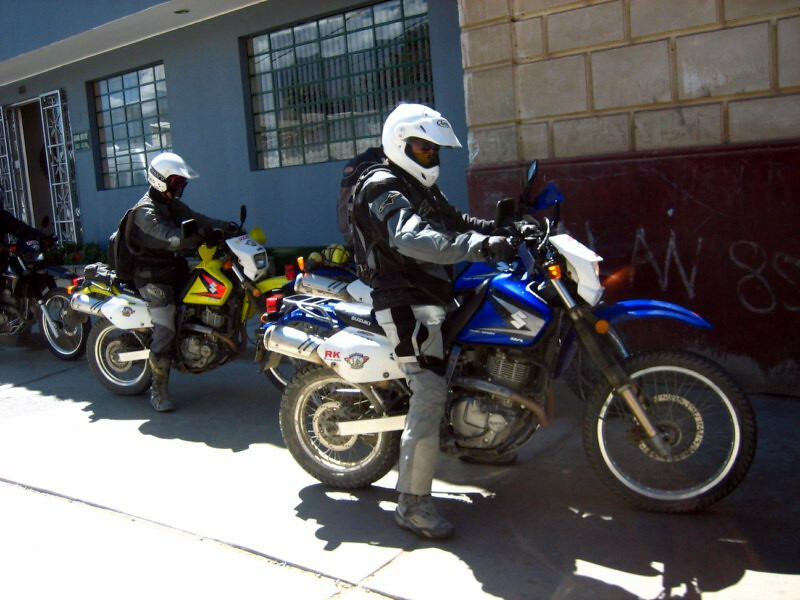 They’re based out of Cajamarca and Lima and run tours around Peru on DR650s. 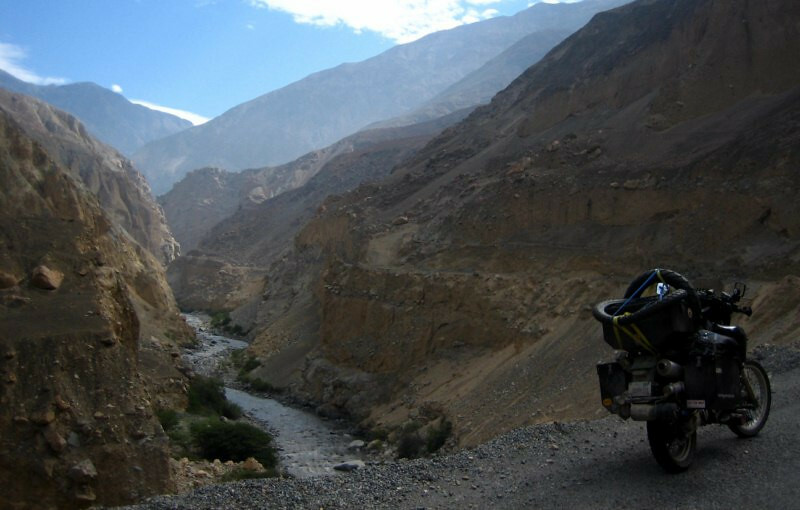 Dave is the owner and he’s from England with a crew of local and English guides. The clients were British. 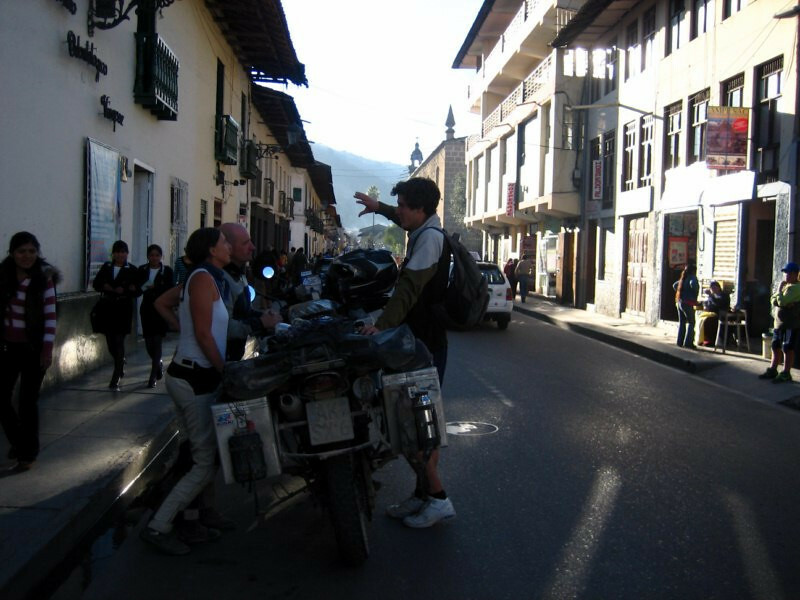 They were heading to Caraz for the night and Dave invited me to stay with them and ride for the next few days. Riding past the hydroelectric plant that was built in 1913 and is the reason the road exists. 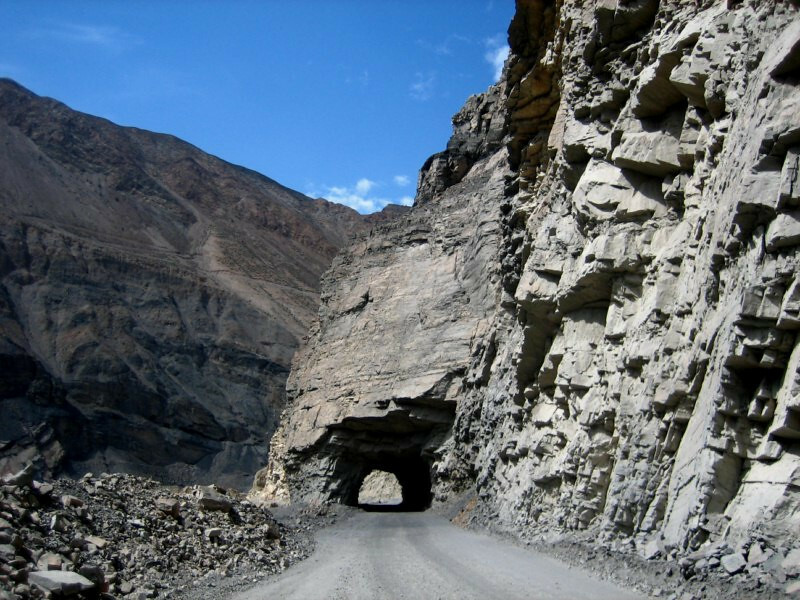 The road started climbing and Dave said more tunnels were ahead. 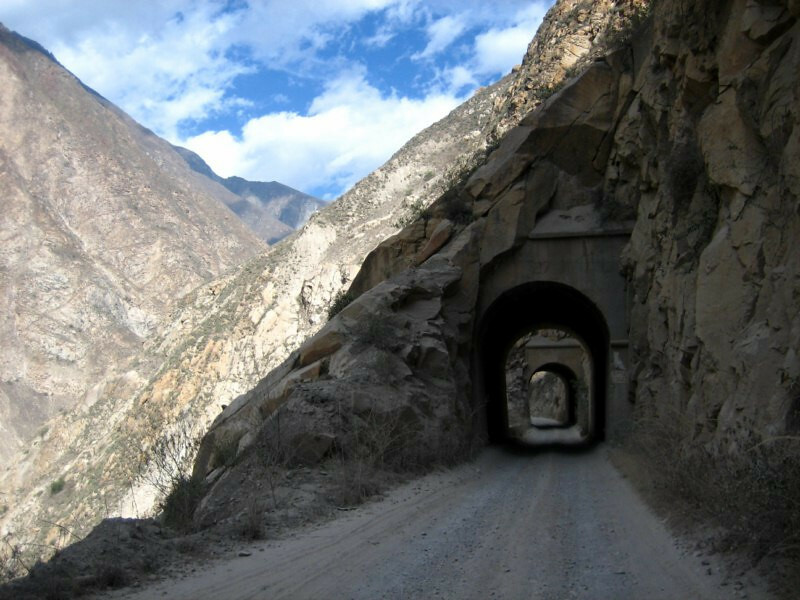 Inside a tunnel with its jagged walls. sanDRina enjoying all the tunnels. 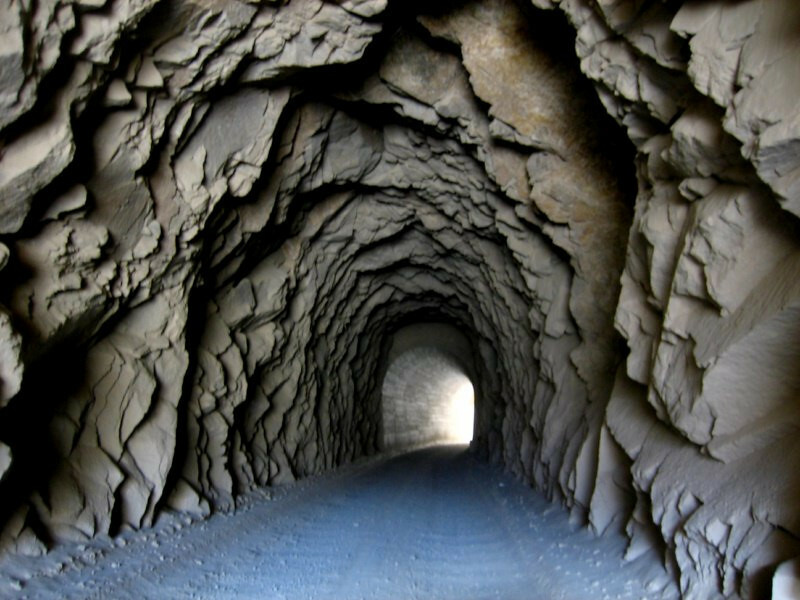 A good ride through the Canon del Pato. 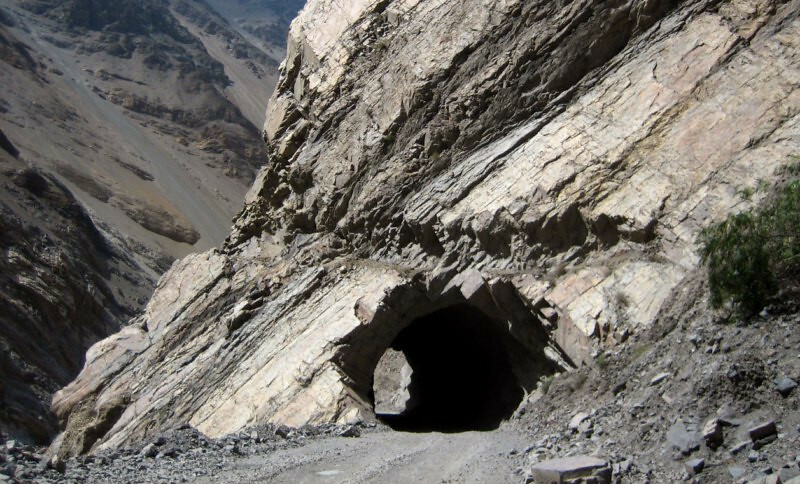 That’s a huge rock topping this tunnel. 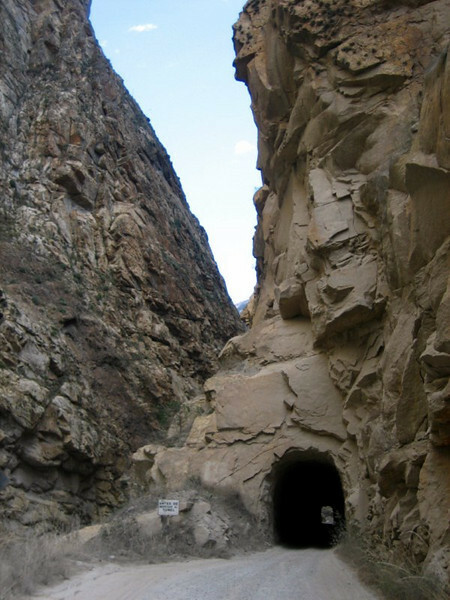 The light at the end of the tunnel, in a narrowing canyon. 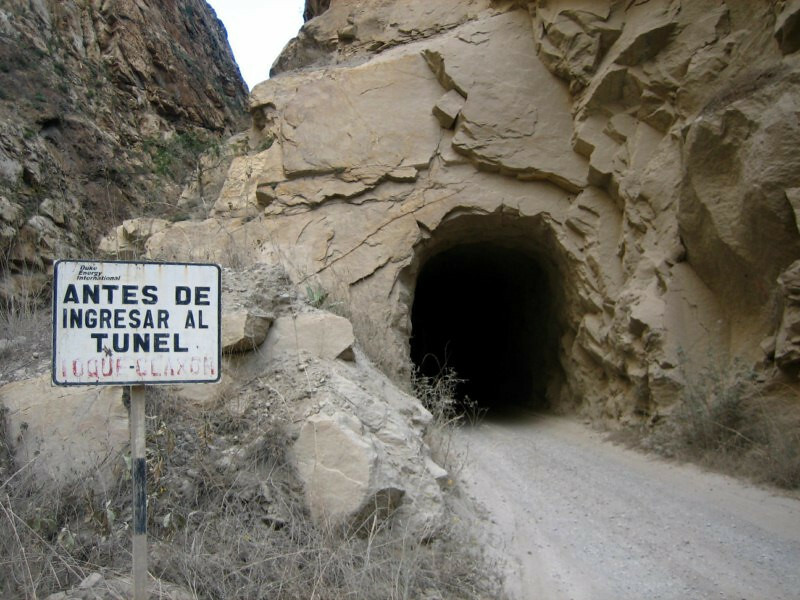 The tunnels are one-way and this sign is asking you to toot your horn before entering. 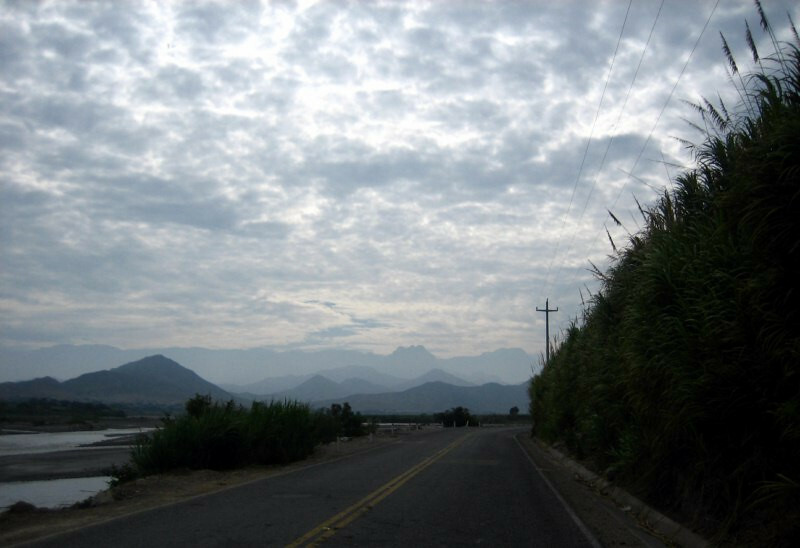 I didn’t encounter much traffic, but there is still some, mainly pickups heading to the hydroelectric plant. 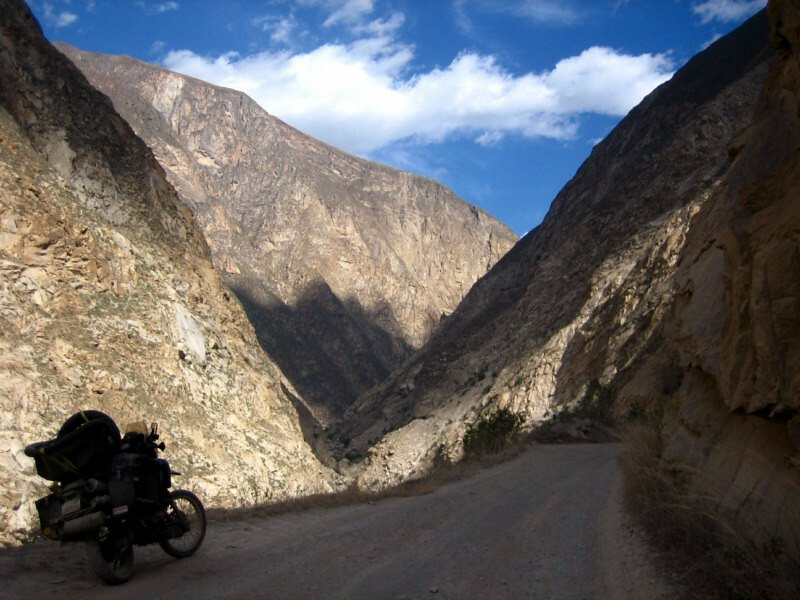 The canyon got narrow in places with the afternoon sun receding quickly and shadows growing. 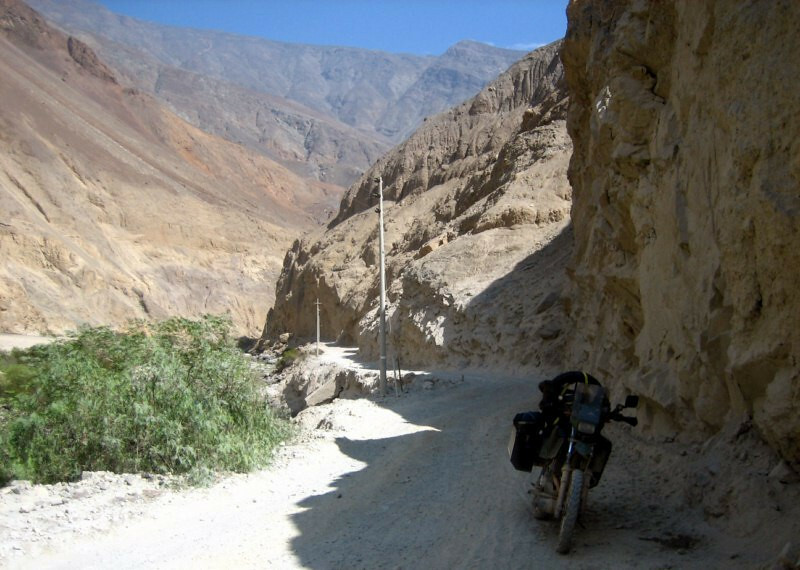 Reaching the pavement as the road got close to Caraz. 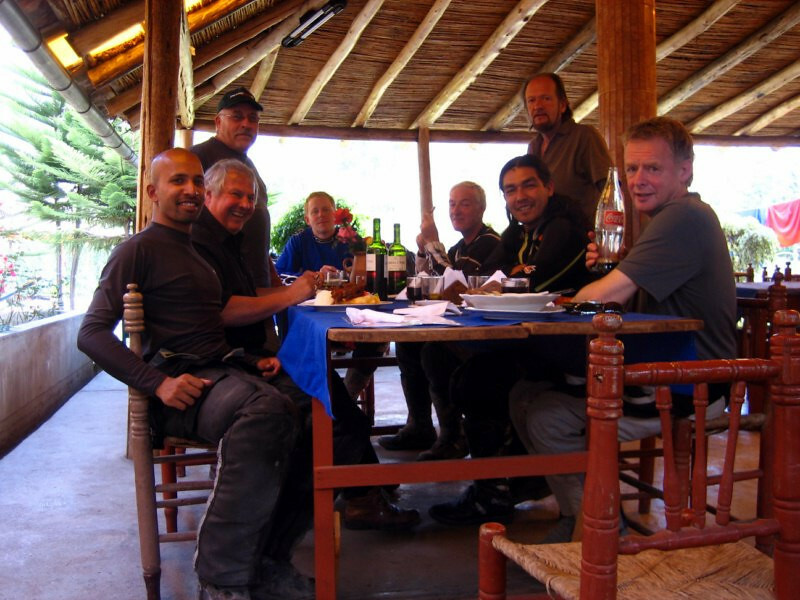 Having a nice dinner with Dave and his crew from Adventure Peru Motorcycling in Caraz. 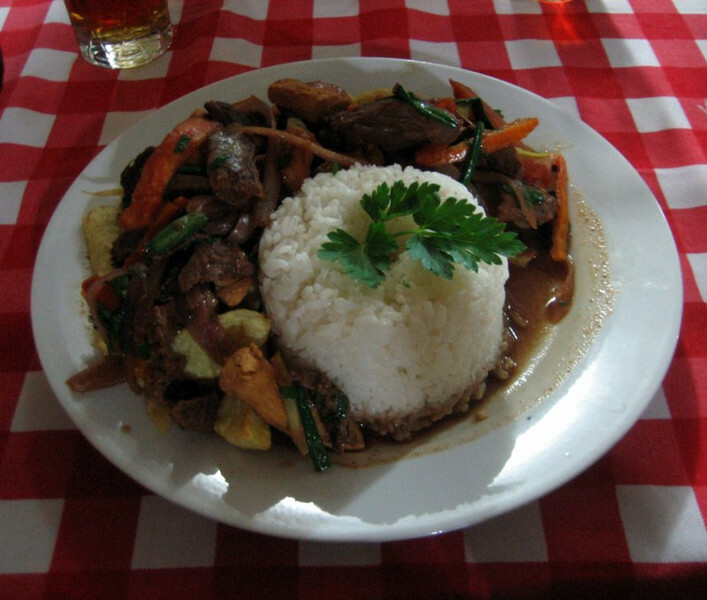 A tasty meal of Lomo Saltado, a typical Peruvian dish of stir-fried beef with veggies and french fries. 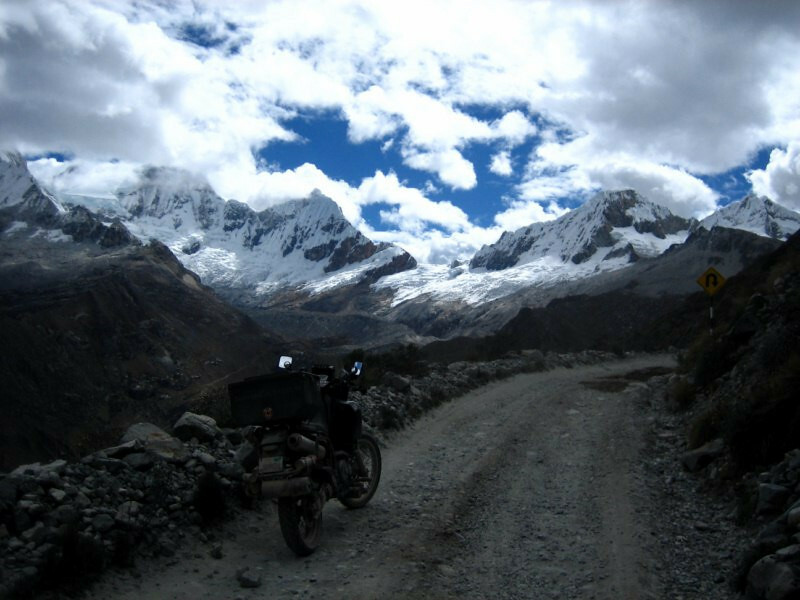 The next day we went on a day ride to nearby Parque Nactional Huascaran, which encompasses the whole Cordillera Blanca (white mountains) above 4,000 m (13,100 ft). S/.5 entrance fee. The shimmering turquoise and emerald Laguna Orconcocha, colored by the minerals from the glacier run-off. 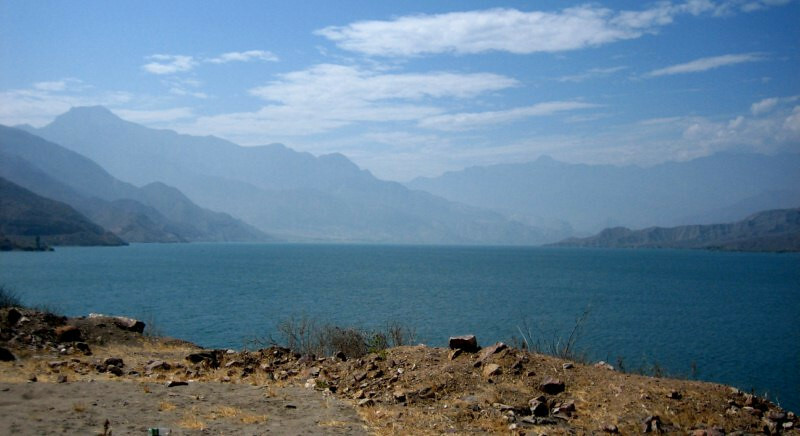 This lake is one part of the Lagunas Llanganuco. Having some snacks at the nearby hut. 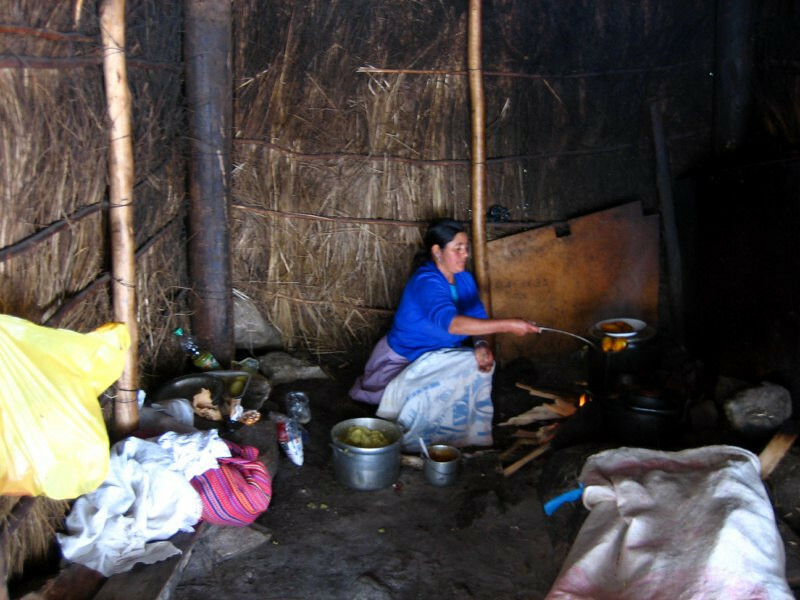 This lady was frying up some Papa Rellena, stuffed potatoes. 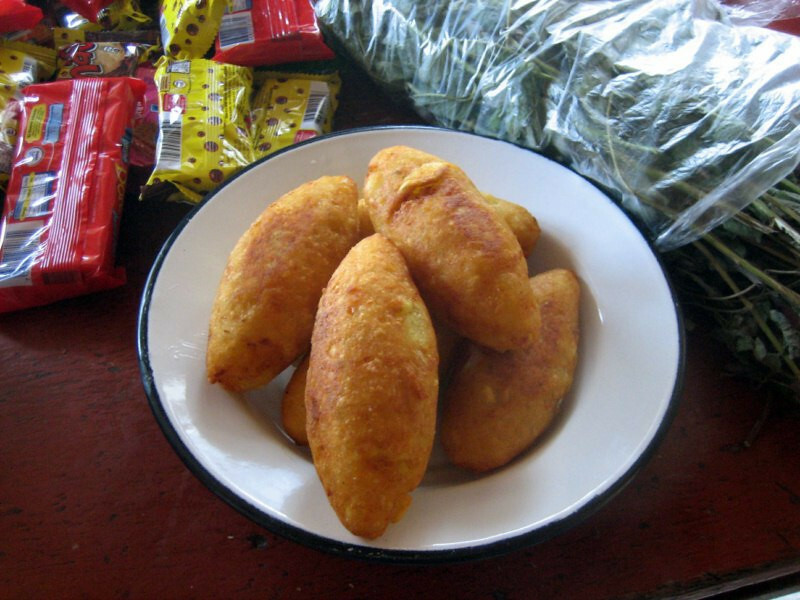 They were stuffed with minced beef and that’s some green hot sauce. 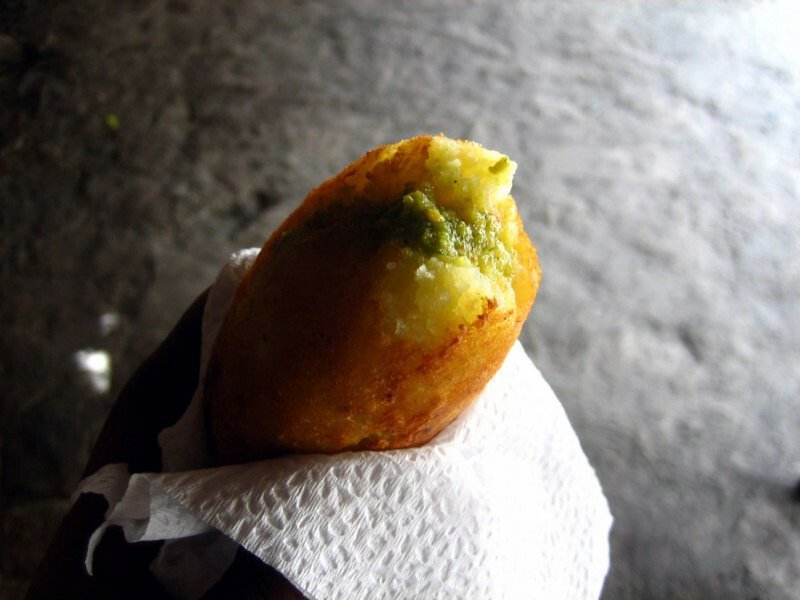 Tasty and just the right thing for the chilly winds at 3,850 m (12,630 ft). 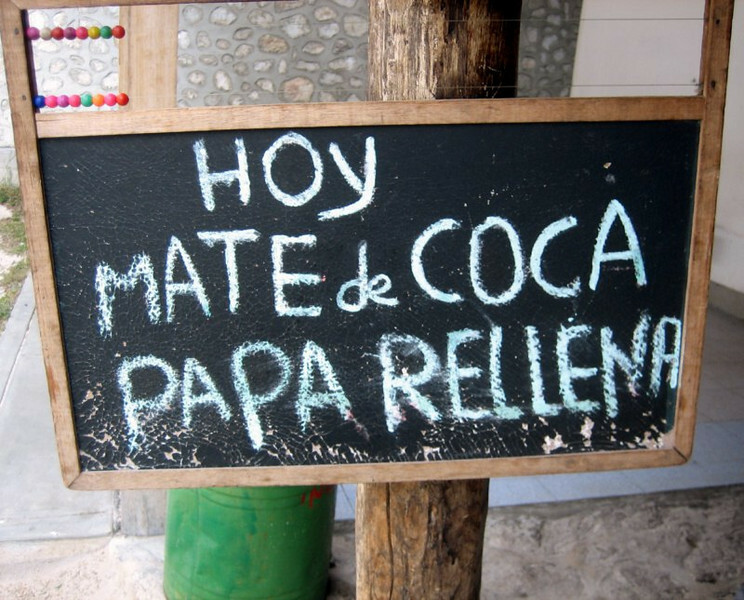 Having some Mate de Coca (coca leaf tea) for the first time. 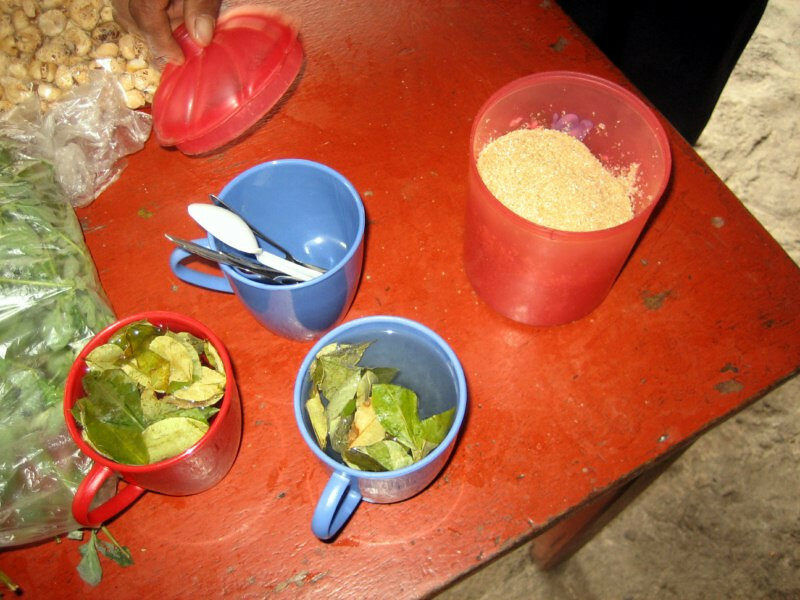 The alkaloids in the leaf help to deal with altitude sickness and other ailments. 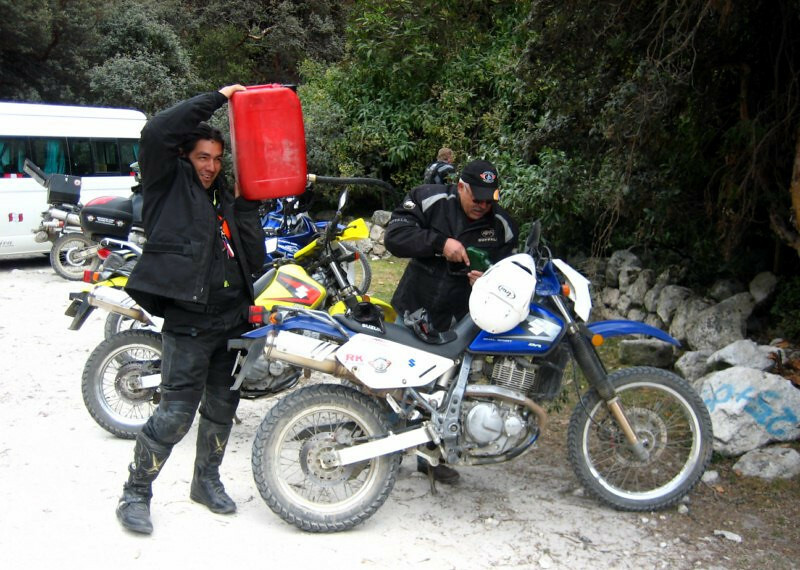 The support crew of Franco and Carlos refueling the stock DR650’s and their 3.4 gallon tank for the run up to the summit of the park. 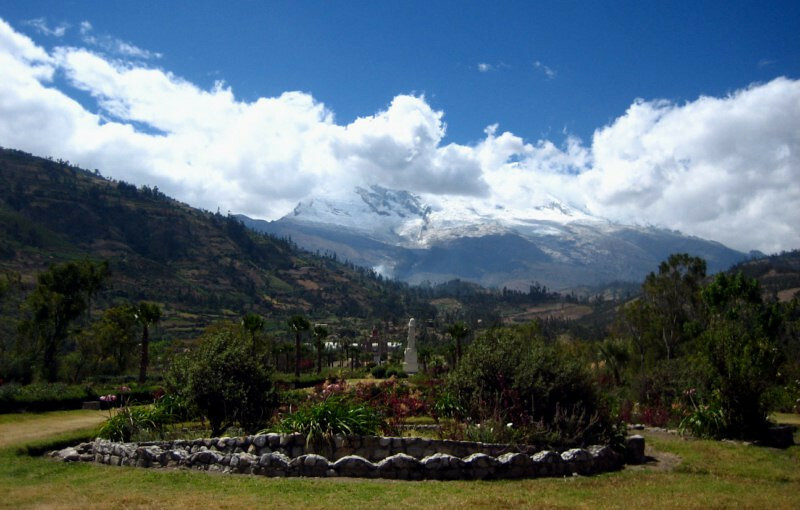 Expansive views of Nevados Huandoy on the other side. The view alternated with each switch-back from one snow peak to the other. 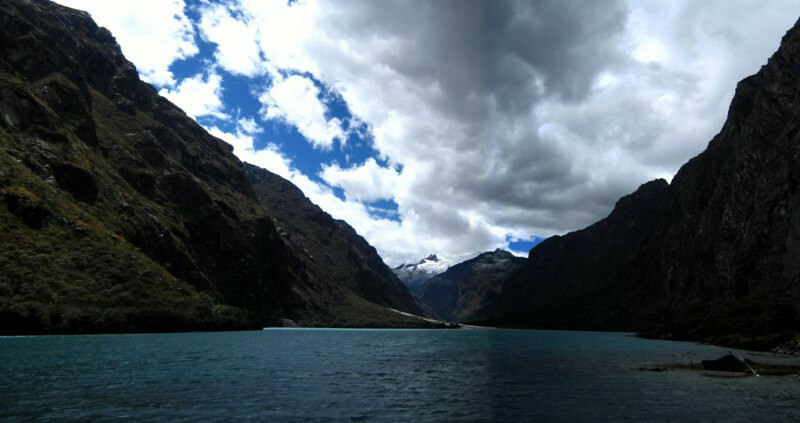 An almost 180 degree panorama of Parque Nactional Huascaran, capturing Nevado Huascaran on the left, the twin glacier-fed lakes of Lagunas Llanganuco in the middle with Nevados Huandoy on the right. 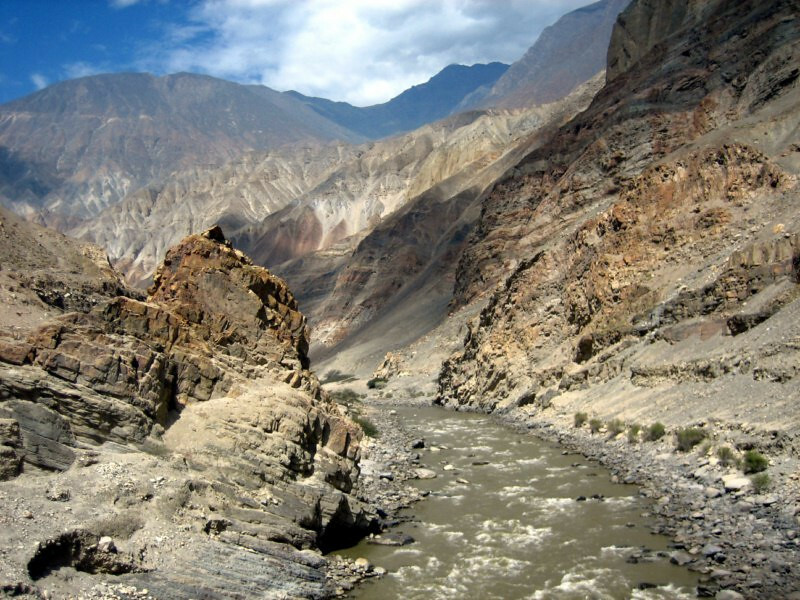 A wonderful feast for the eyes, especially with the clean high-altitude air. 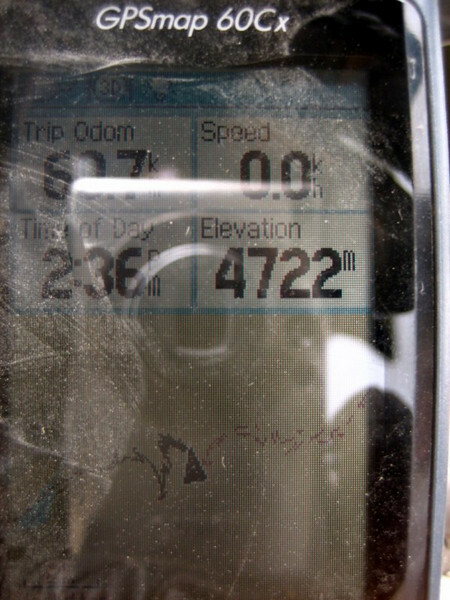 At an altitude of 4722 m (15,490 ft). The highest yet on this trip. It was fun riding sanDRina without the weight of all my cargo. 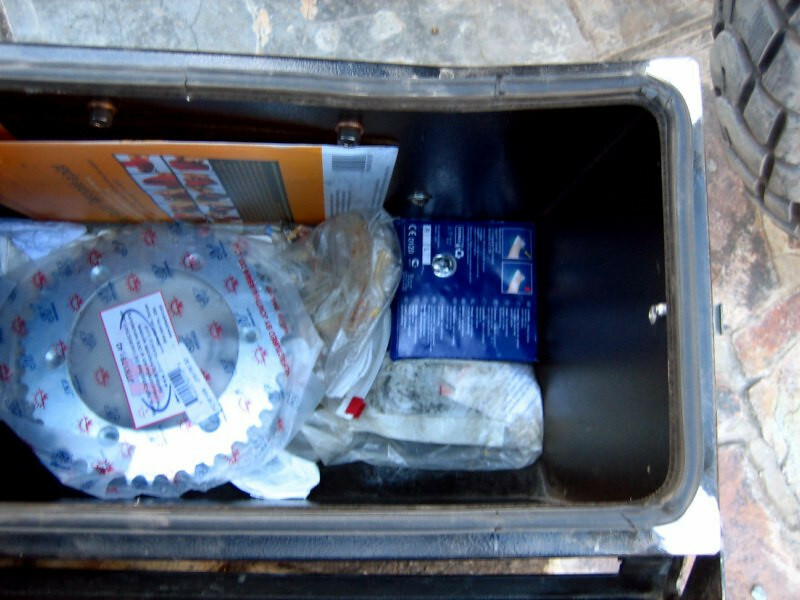 I left the side panniers at the hotel room and emptied the top box. 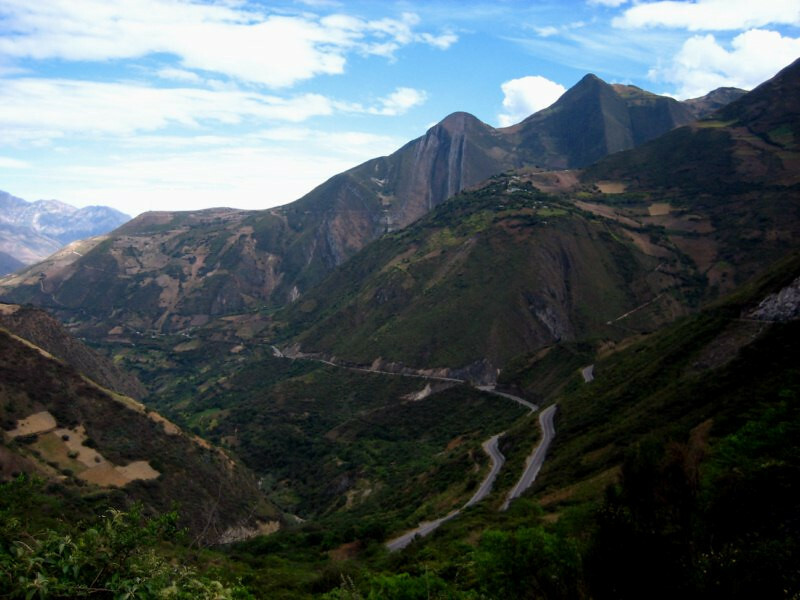 A wide view of the sinuous track leading up to the summit under Nevados Huandoy. 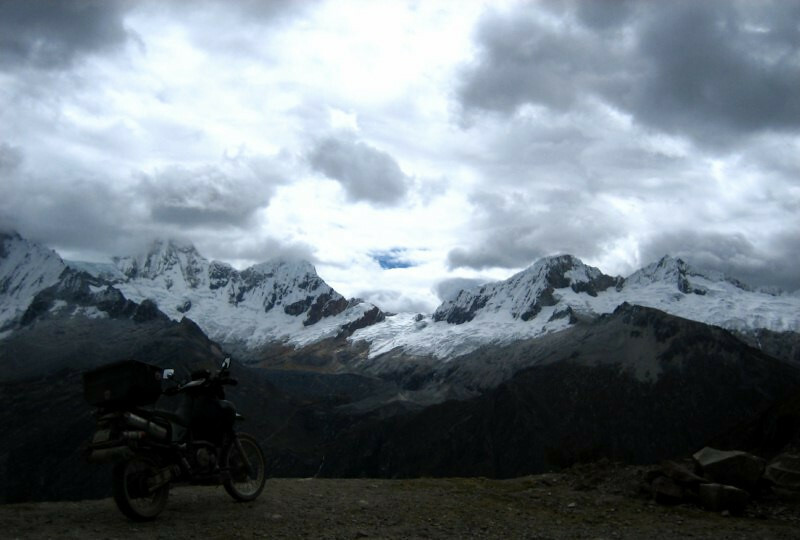 sanDRina posing under Nevado Huascaran. 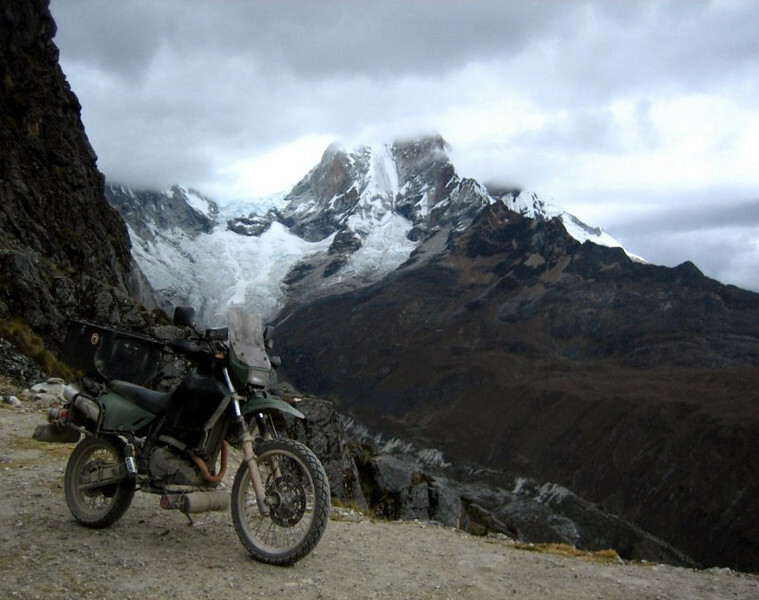 I like how as the glacier is getting more filled with dirt and rocks, the image blends it with her windscreen, flowing the energy of the glacier into the bike… Ommmm. 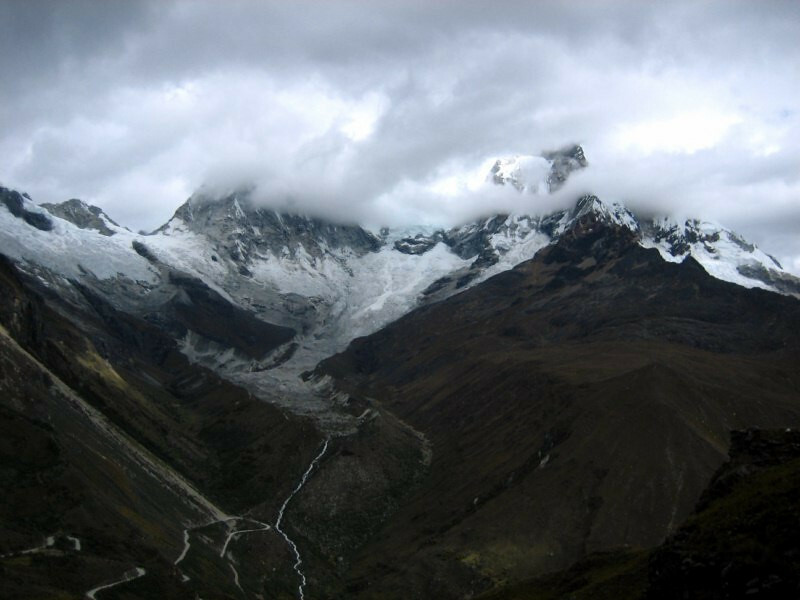 Nevado Huascaran with its shrinking glacier turning into a stream running down to Laguna Llagucho. Riding by the glaciated lakes on my way out of the park. Heading back down to the main road as the afternoon wore down. 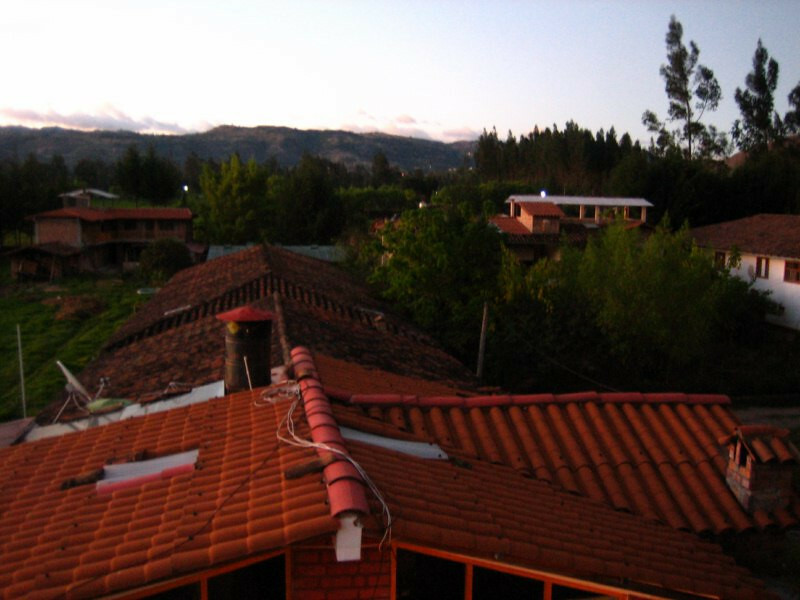 Strong sunset colors over Caraz. Having some dinner at a chaufa (Chinese restaurant), which provides an economical meal anywhere in the world. 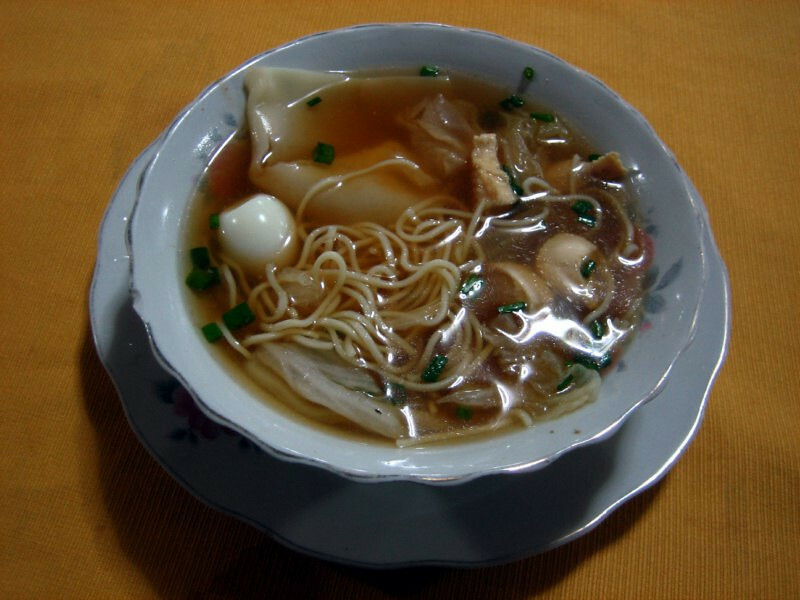 The hot soup was good to warm up to after the chilly day up at altitude. sanDRina enjoying the company of all the other DR’s in the courtyard at the hotel. The APM crew also had a Honda Africa Twin and a 250cc Tornado. 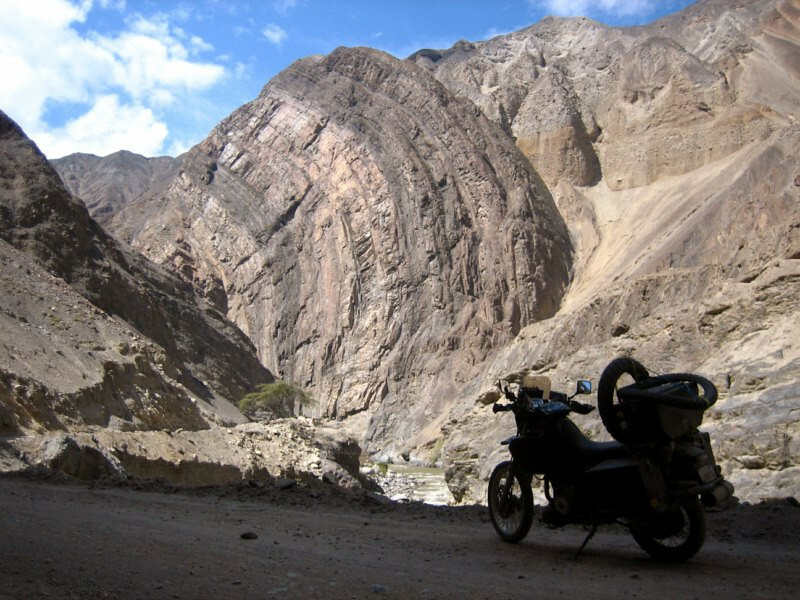 One of Dave’s clients was a friend of his from the UK riding big BMW GS’s and he was complaining of the puny DR650s the whole trip and Dave loved it that I came along to show him what a capable bike the DR650 is. 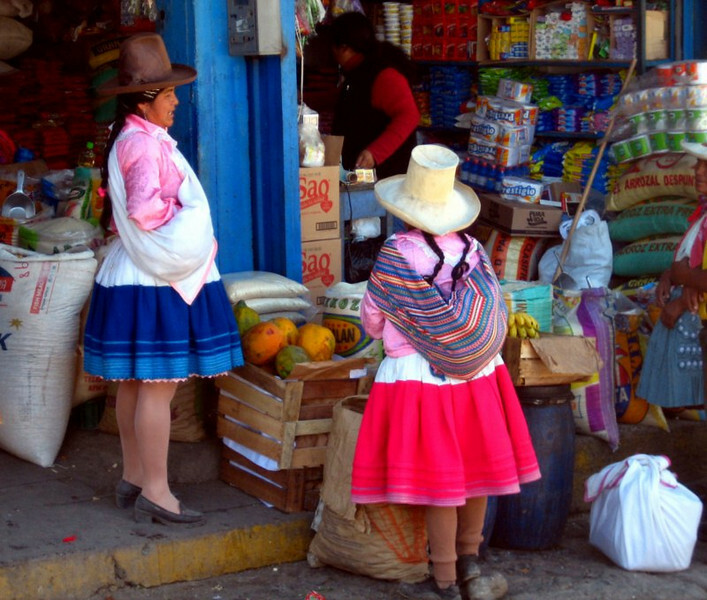 Taking a walk through the market in Caraz. Ladies in traditional clothes. The hats vary between regions and almost every woman had a hat. They didn’t look to be the warmest design, but fashionable, for sure. 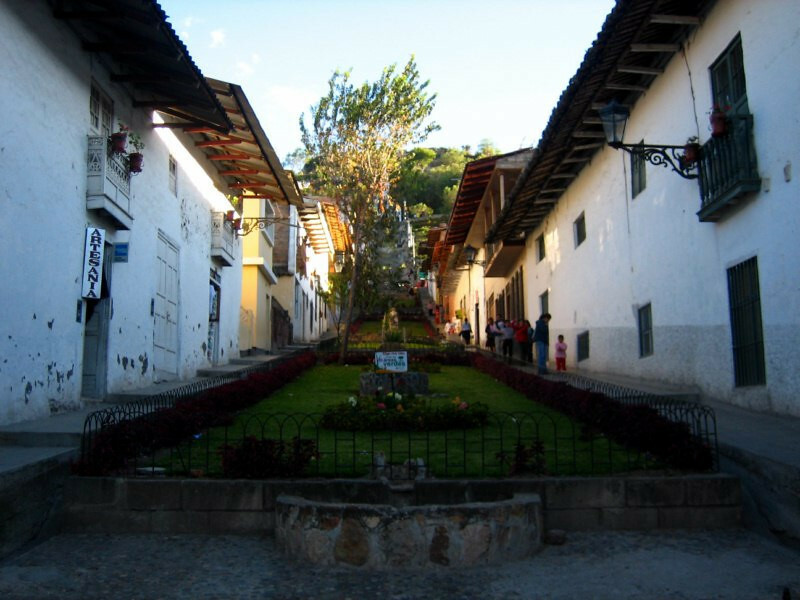 It’s a smaller city than nearby Huaraz, which is considered too touristy nowadays and not as charming. 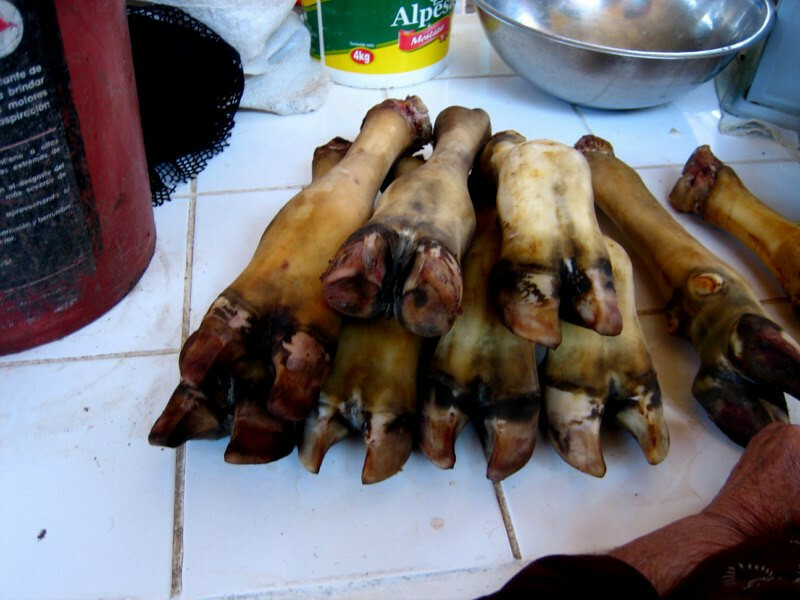 Cows’ hoofs, ready for a tasty soup. 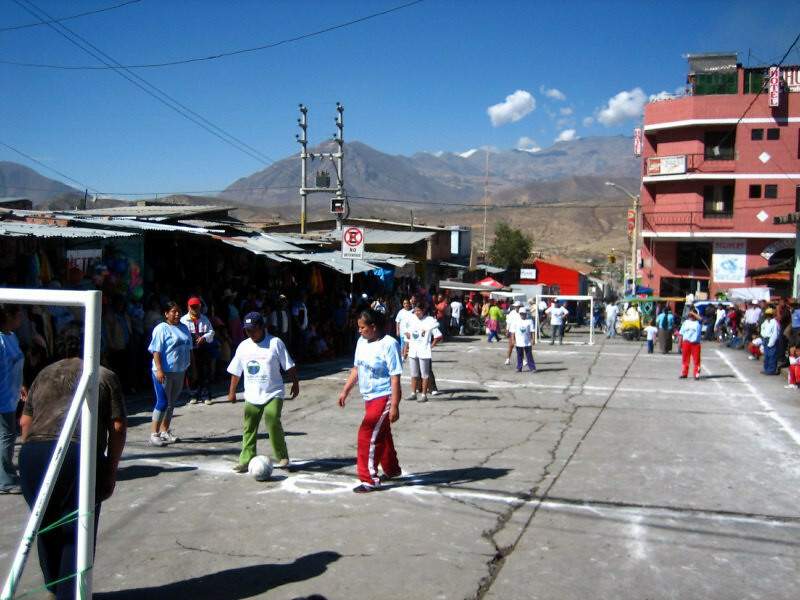 A game of women’s football in the streets, as the excitement for the World Cup grew. 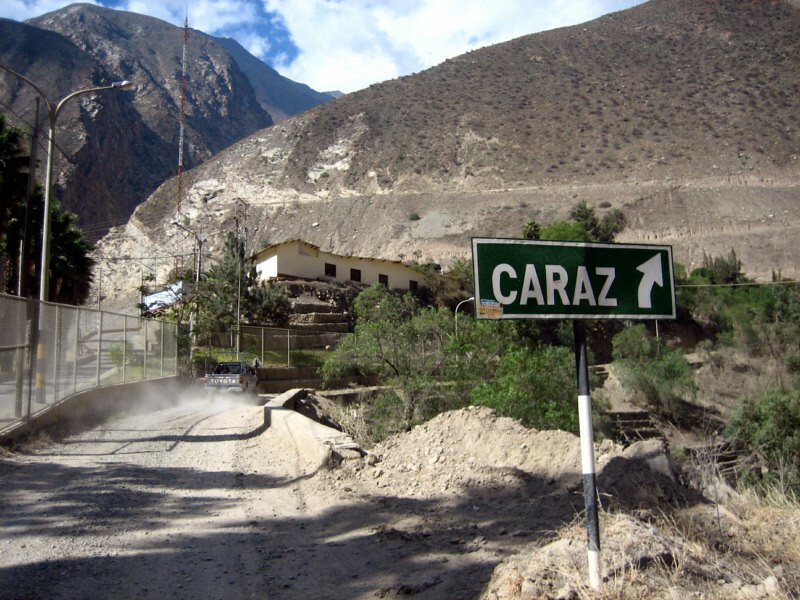 Heading out of Caraz to Huaraz. 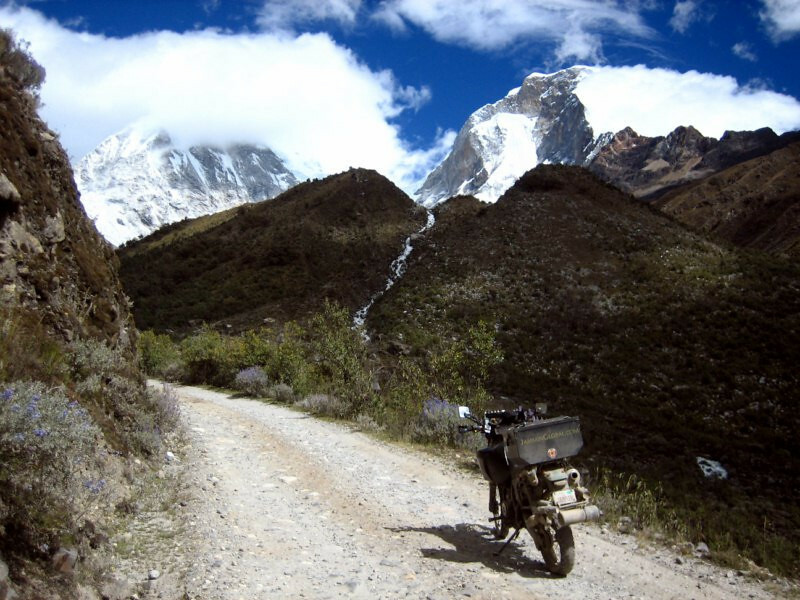 Riding with the guys from Adventure Peru Motorcycling to Huaraz. 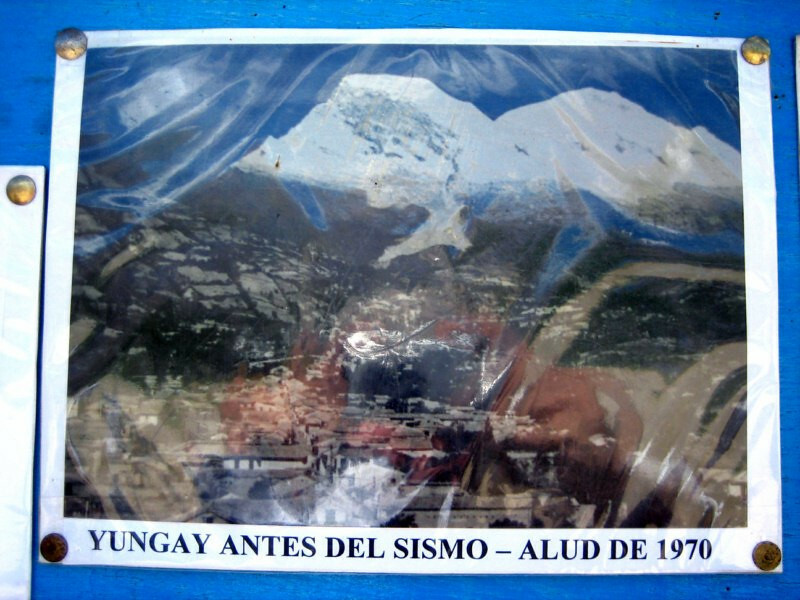 Stopping by the memorial to the town of Yungay, which was wiped out by a earthquake-induced landslide in 1970. 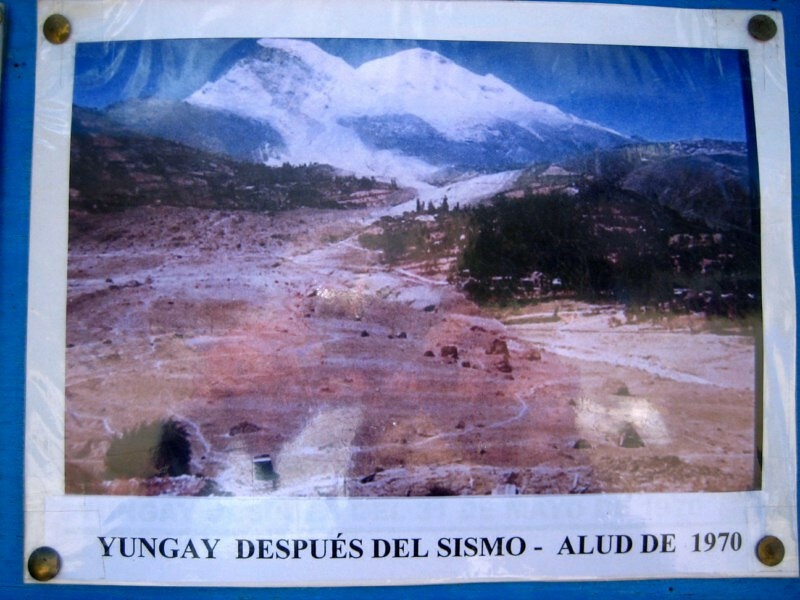 This is a picture of the town below Nevado Huascaran before it got destroyed. And this is the after shot. 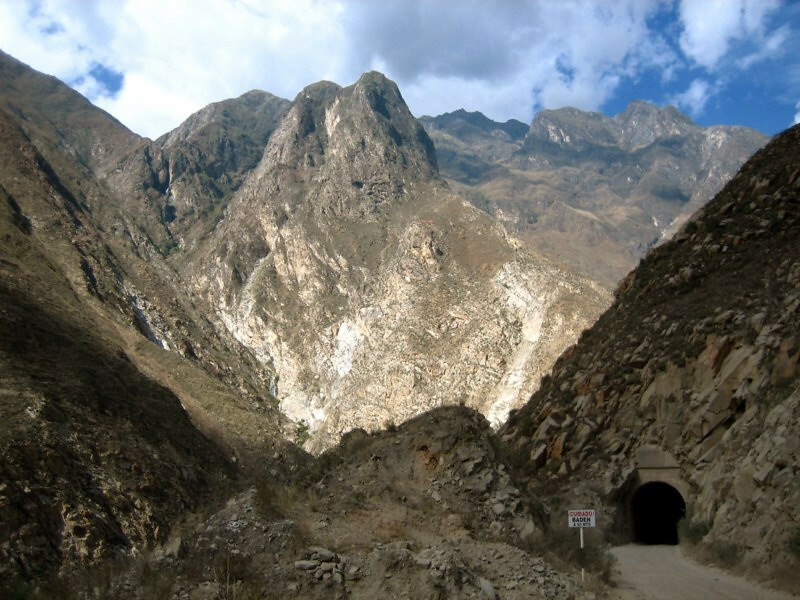 The entire town was buried in debris that came racing down the steep slopes and took 18,000 lives in one swoop. 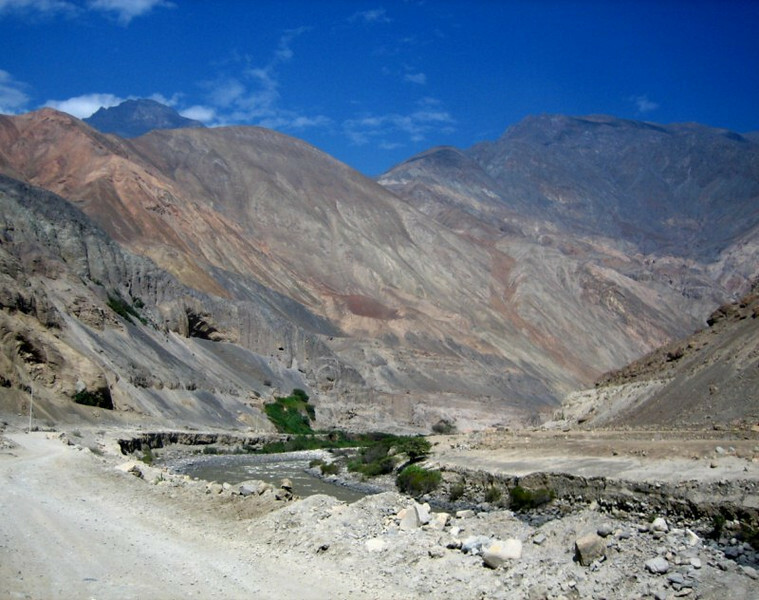 A lake that was formed with melted glacier water was unleashed during the earthquake to become the landslide. 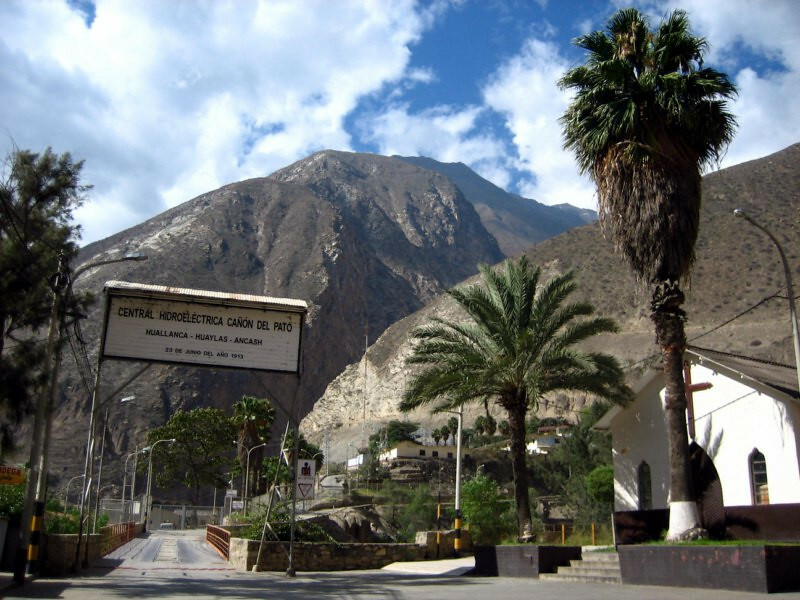 The site of Yungay with a memorial built over the buried town. The new town has been shifted to a safer location. Having lunch with the APM crew. 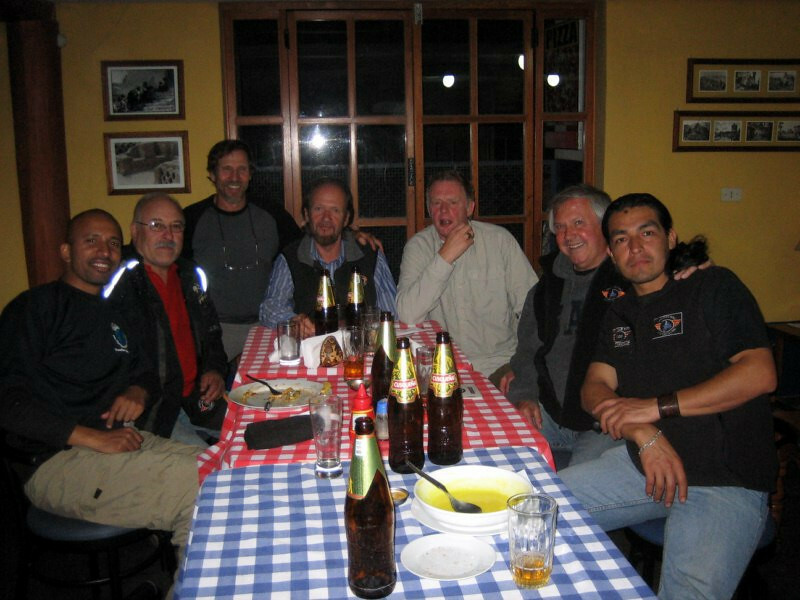 L-R: me, Dave (owner), Carlos (support van driver), Steve, Alan, Peter (English guide), Franco (Peruvian guide), Allen (who didn’t like the DR650). 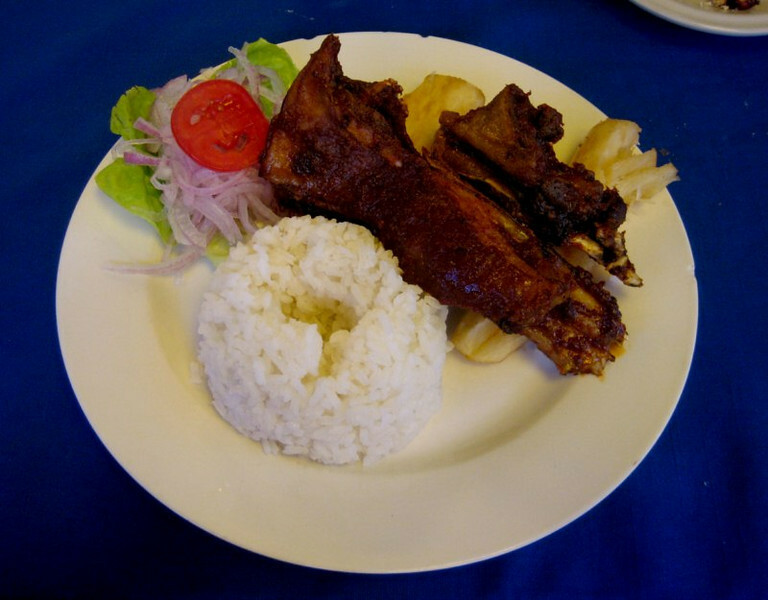 A tasty lunch of lamb chops. 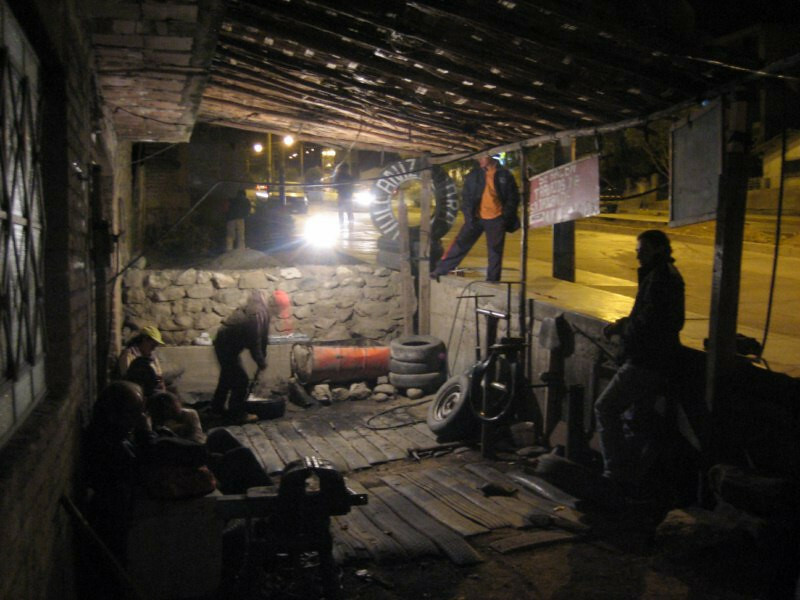 Picking up a nail as we rolled into Huaraz. The bike fell over on her right side as the tire deflated after parking her. Going about the process of removing the tube from the tire to get it patched up. My right-side pannier got bent around the pannier frame as the bike fell on this side. 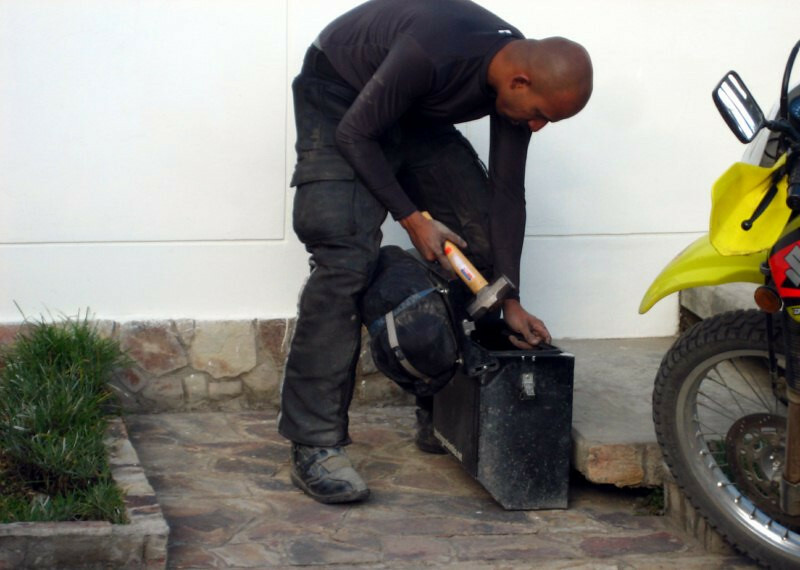 Carefully reshaping the pannier so that the lid would close again. At a llantera (tire shop) getting my HD tube patched up. I had 3 punctures in the tube. Dinner that night at Chilli Heaven, a restaurant run by world biker Simon preparing all sorts of curries. 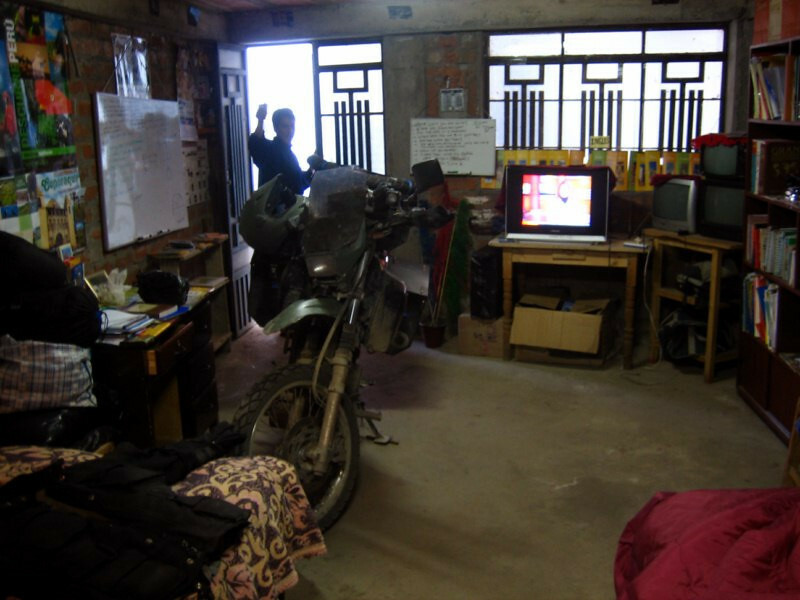 He rode around the whole world and decided to settle down here in Huaraz, where there are also many other expats. 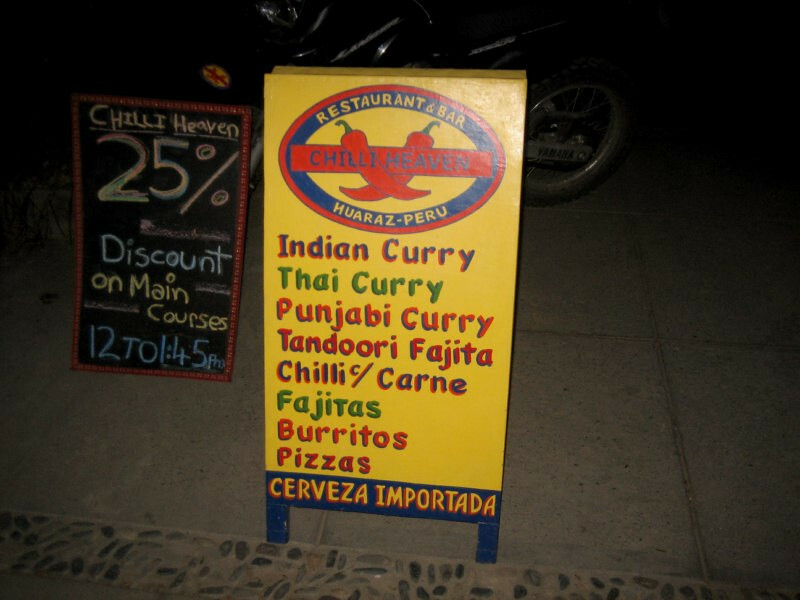 I had to have the Madras Chicken Curry, but to be honest, it wasn’t that good. 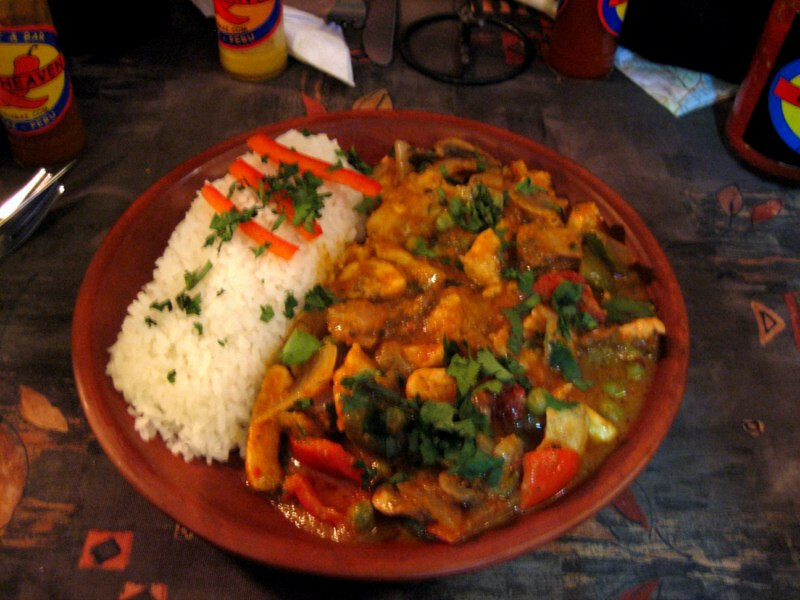 Tasted very much like a dish prepared by foreigners and yes, I think I can make a better curry, haha. The tube went flat again over night and I think the old Kenda K761 carcass was just about done. I wrung as many miles out of it as possible, 17,230 kms (10,700 mi) and decided to mount the new Metzeler Tourance that I’ve been carrying since Medellin, Colombia. 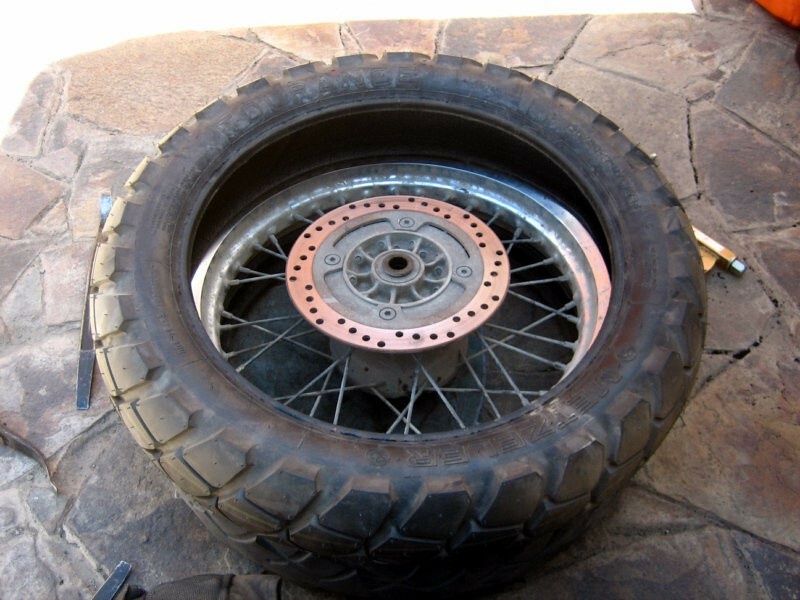 I warmed up the new tire in the sun for a few hours (as I watched the England vs Germany World Cup game) and it was surprisingly very easy to mount the new tire. I didn’t even use any soap nor lubricant. 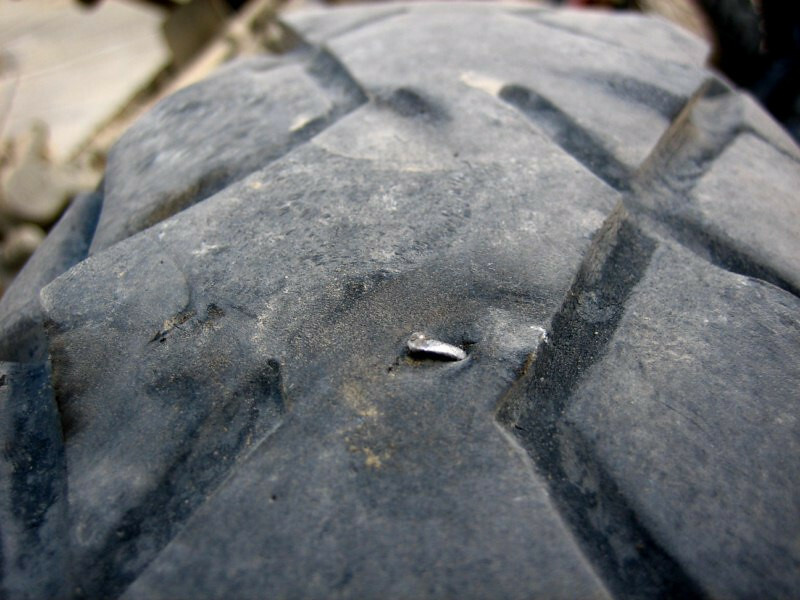 I remember one lesson strongly from a tire-changing session to “never fight the tire” and thus you shouldn’t have to use too much force to get the tire on. 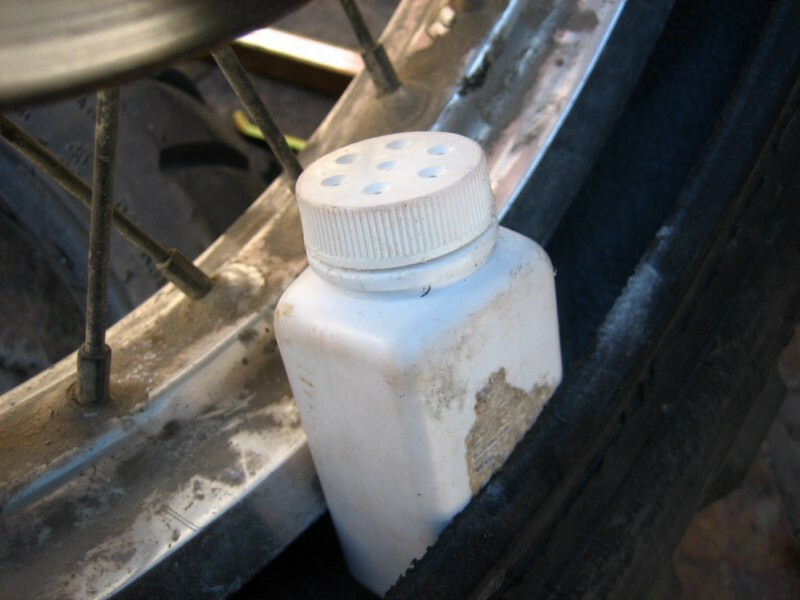 Putting some baby powder in the new tire to help the tube expand effortlessly and reduce chances of pinching. 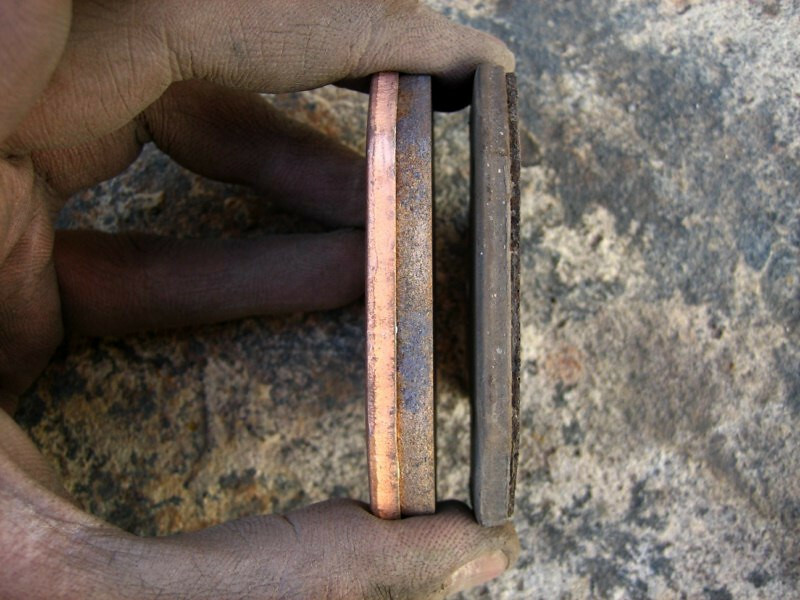 I also figured it was time to change the rear brake pads (old on right). 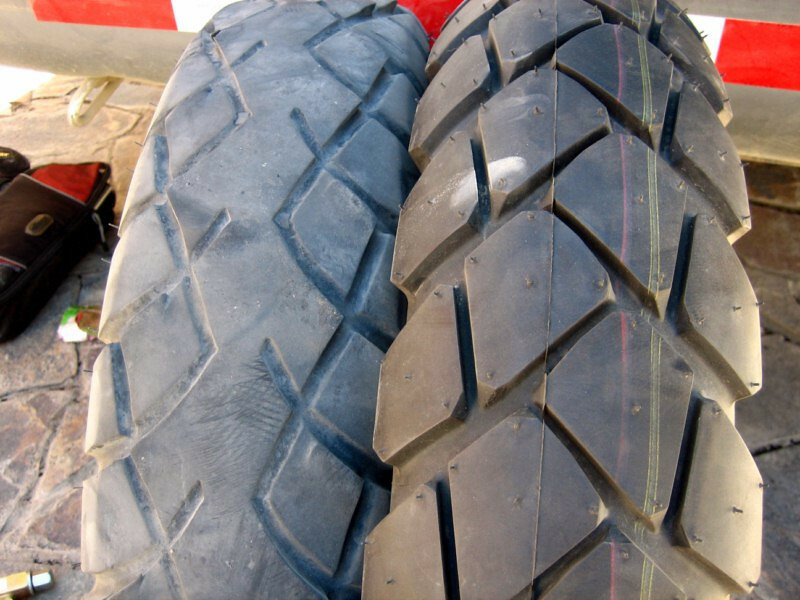 I mounted those before my Continental Divide trip and got 32,200 kms (20,000 mi) out of them. Looks like maybe a thousand or so kilometers left, so I kept the old one as an emergency spare. With dirt riding, I’ve been using more rear brake than front and with all the weight of the bike, even on the tarmac, I find the rear brake stronger than the front. 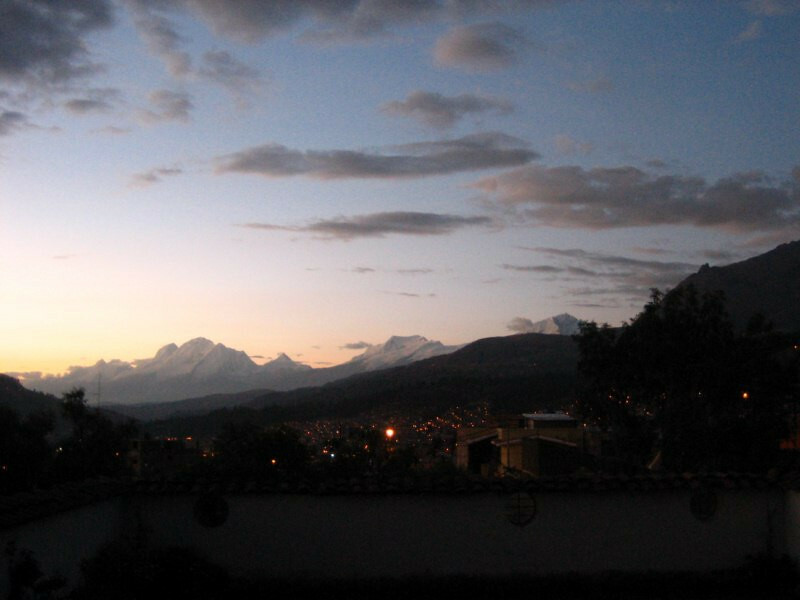 A pleasing sunset over the Cordillera Blanca and Huaraz. Spending the night with Ivan from CouchSurfing who works as a local tourist guide.